There are 47 posts filed in Courses ( this is page 2 of 5). 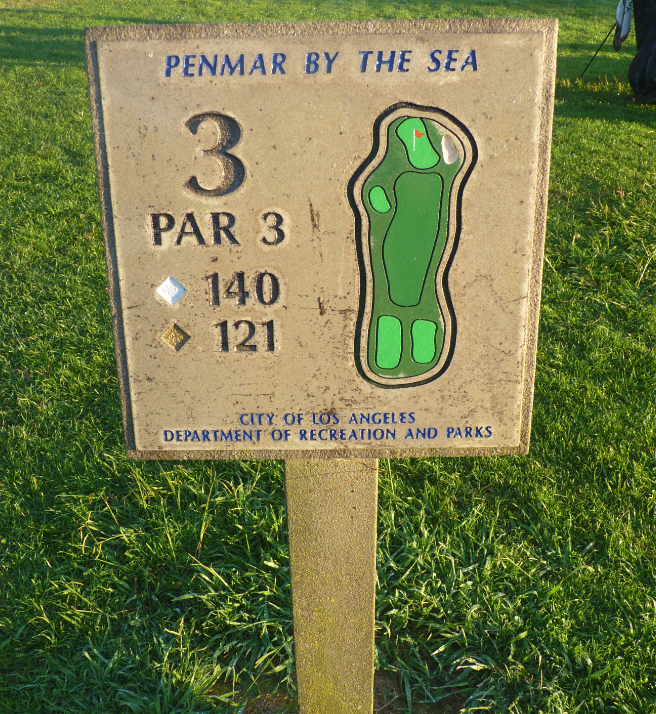 Penmar, or Penmar by the Sea is a 9 hole golf course in Venice Beach. 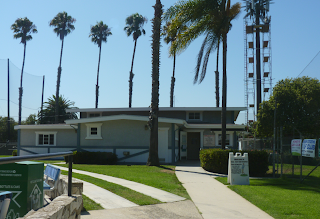 It is right on the border with Santa Monica and is next to the Santa Monica airport. The course is a par 33 executive golf course, although it could probably also be classed a regulation 9 hole golf course. 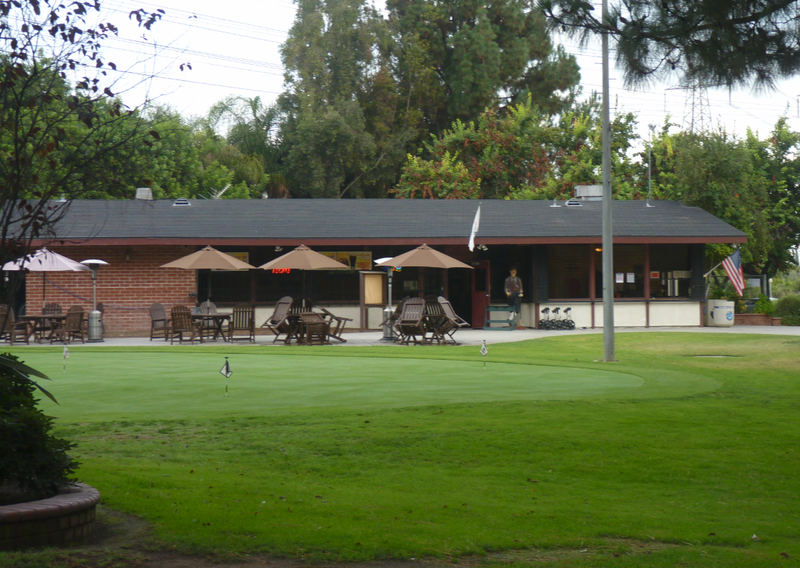 There is a small cafeteria/ bar area and a practice putting green by the first hole. I did not see a driving range at this location. This course is busy! 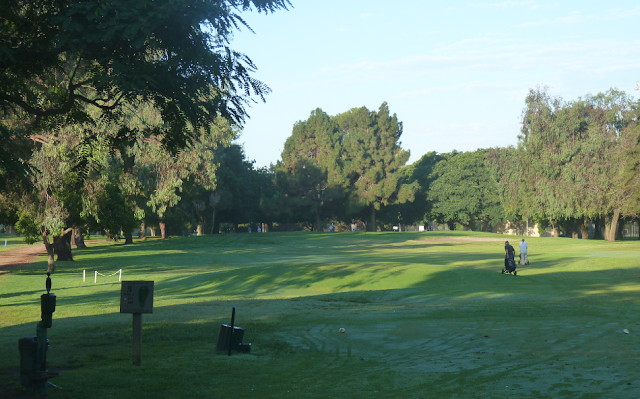 In fact it is written that it is the busiest 9 hole course in the entire USA. Although I have seen no data to back that up. 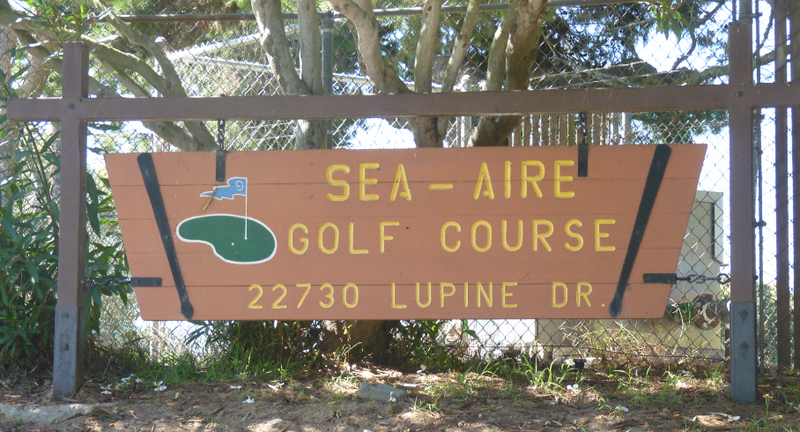 Tee times are not required, but recommended. Talking of which I booked a tee time through the City of LA booking system. I paid a $5 charge which I presumed was a booking deposit. 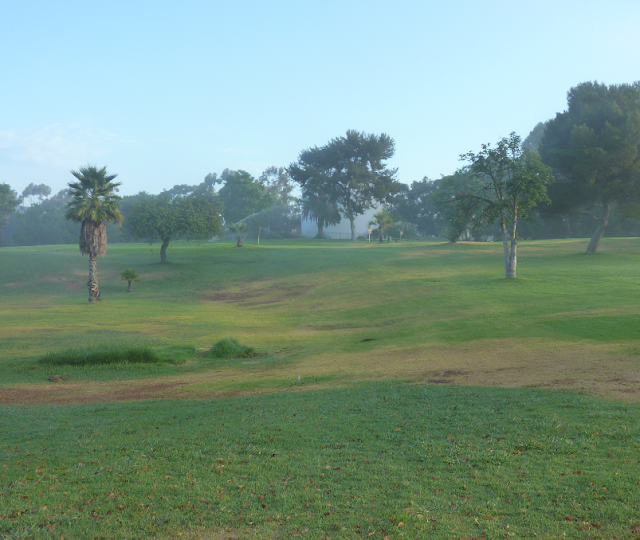 When I arrived at the course I had to still pay the full green fee. The $5 was purely a booking charge. So be warned! If you play at the City of LA courses a lot you can get an annual pass which allows you to book in advance and avoid the fees. It is reasonably priced. The course is unique in that it seems to only send 5-ball’s out. Each group is formed with 5 players, not the typical 4. If there are only 2 or 3 of you, you will not be allowed to play on your own. You will be paired up. I think that this is due to the popularity of this course. I played early, and I mean early. It is pretty much still dark out and there were only 3 or 4 groups ahead of us. Even then there was waiting at to start every hole. The round took just over 2 hours. If you play any later than 8am, expect to spend 3+ hours to play the 9 holes. 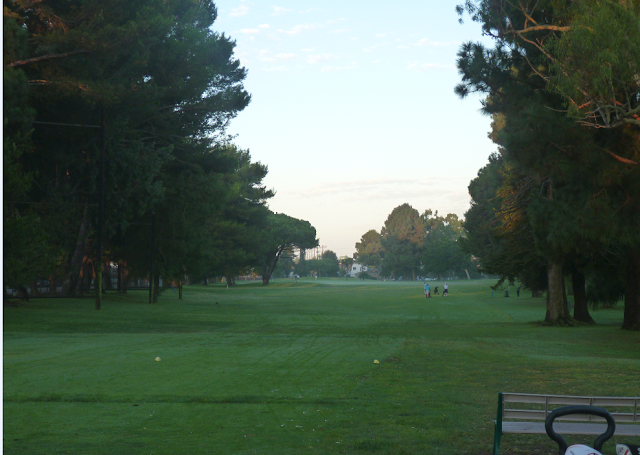 When I finished the round (at about 8.45am) there were a lot of people waiting to play. I would estimate there being a good 20-30 people milling around. The course is a long 9 hole course – 2,582 yards. 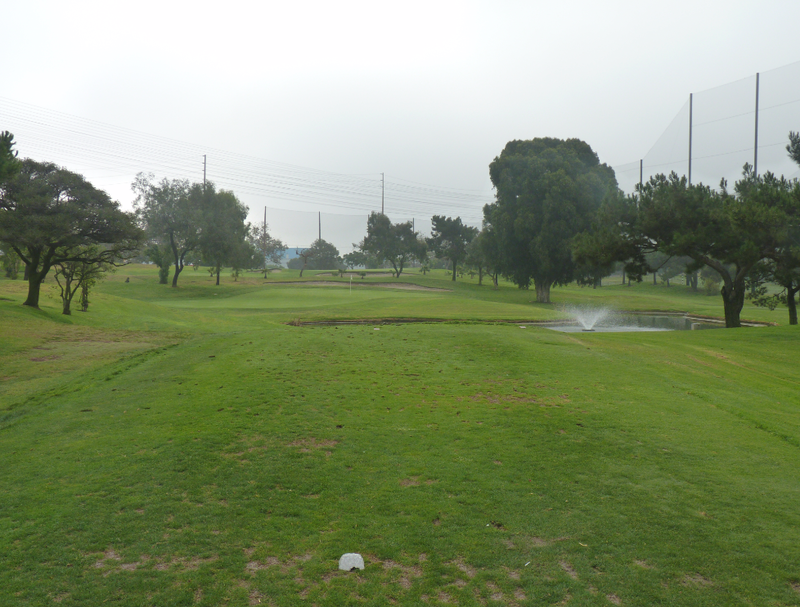 There are three par 3 holes and six par 4 holes. The longest being 425 yards. This is good as it gives you an opportunity to rip a driver or a wood on a regular basis. 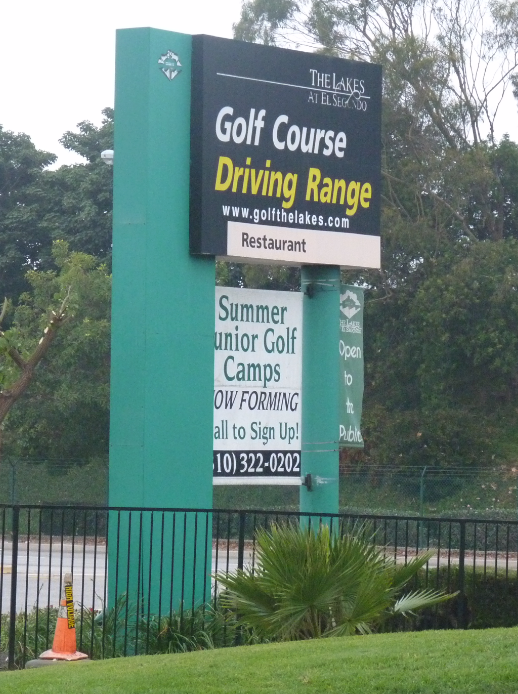 Being such a long course I recommend it only for the more advanced golfers. I would not recommend it for beginners or hackers. 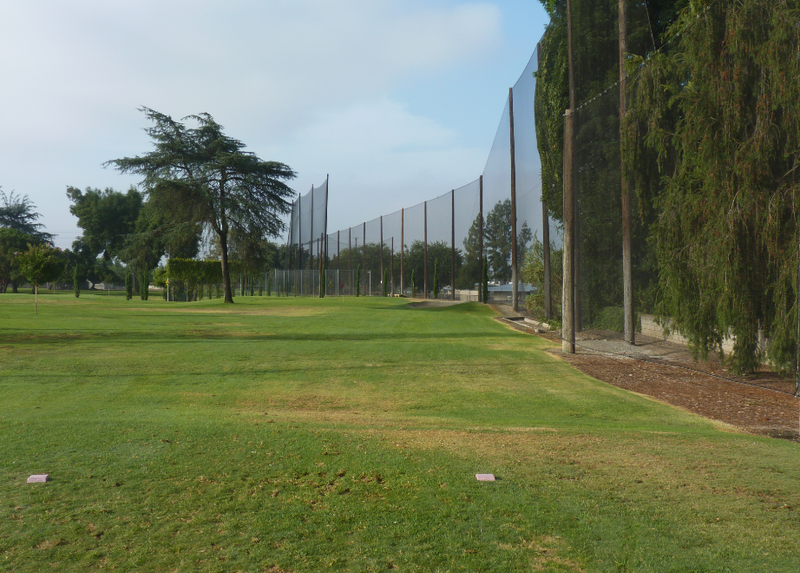 To play here you should be able to consistently hit a wood/ driver 200 yards. The fairways are narrow on some holes and the key to shooting a low score on this course is long and accurate drives (which I guess is pretty much the same with any course). 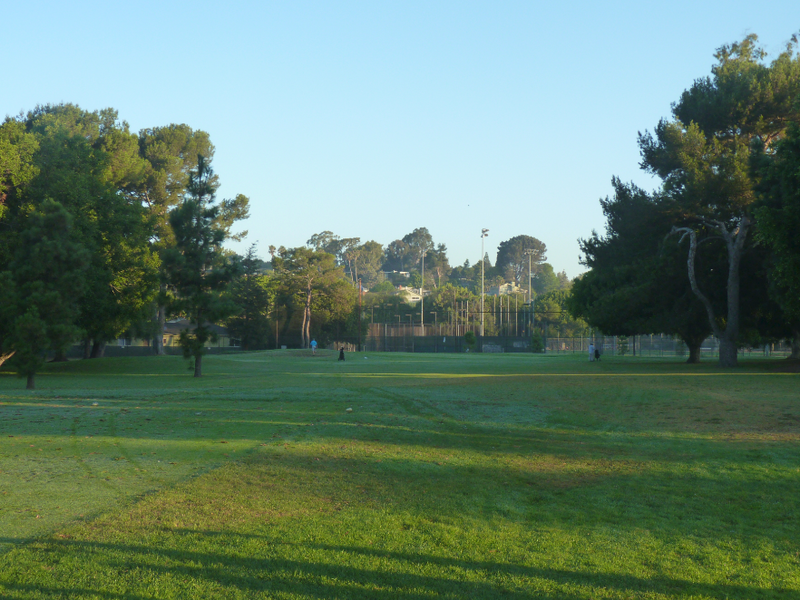 The course is your stereotypical USA woodland course. 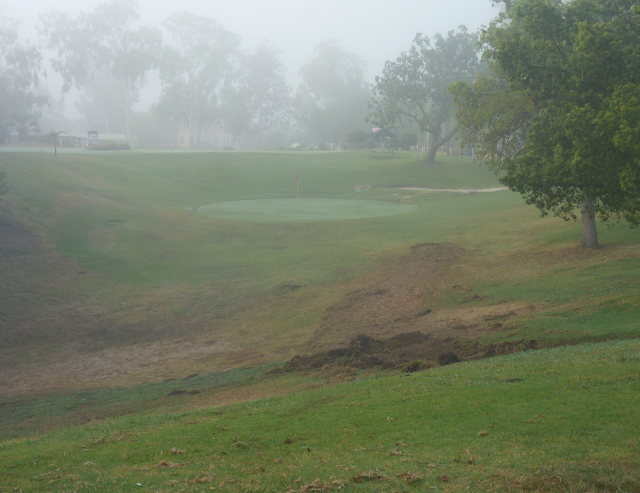 The holes are lined with trees and they are really the only form of hazard. There are a few bunkers out on the course, but not on every hole. The course is extremely flat with no elevation changes on the holes. 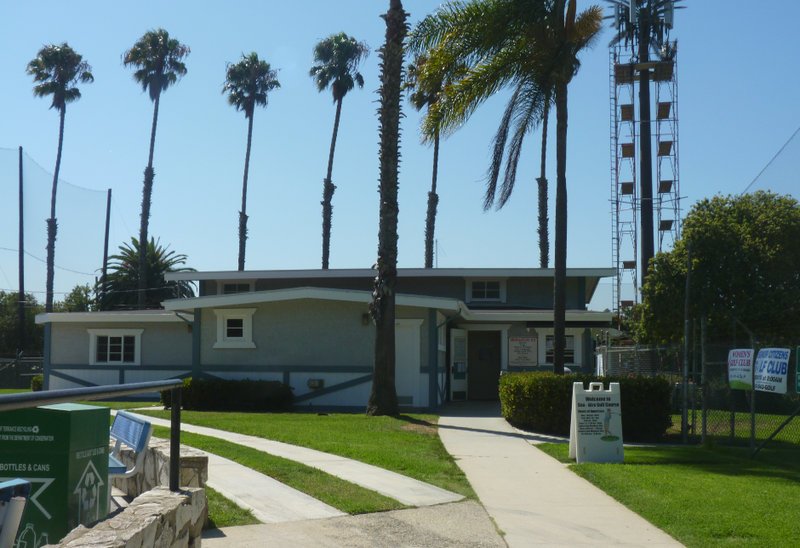 It is about a mile from the Pacific Ocean and 200ft above sea level. The course can be challenging when the wind blows in off the ocean, but when I played it was perfectly still. All of the holes are pretty much flat and straight. 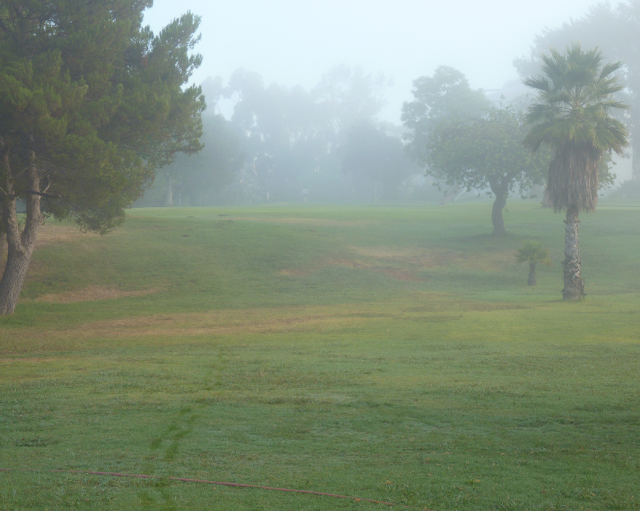 The exception to this is hole 8. 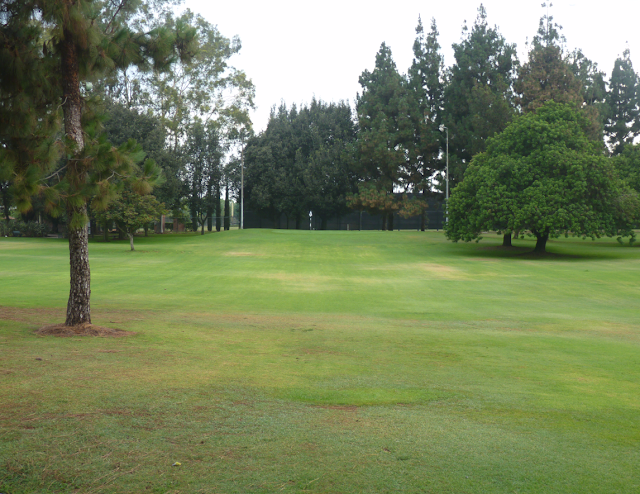 With this 162 yard par 3, you have to hit over a tree from and a slightly elevated tee box. 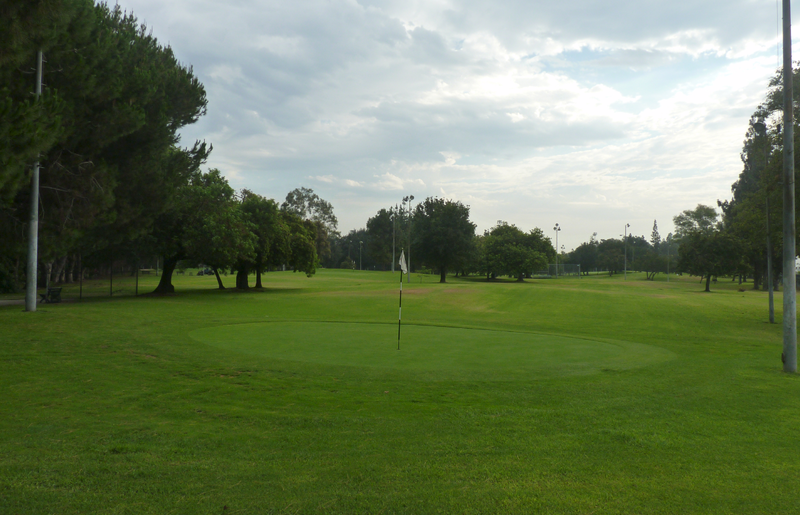 The course itself is very well maintained. 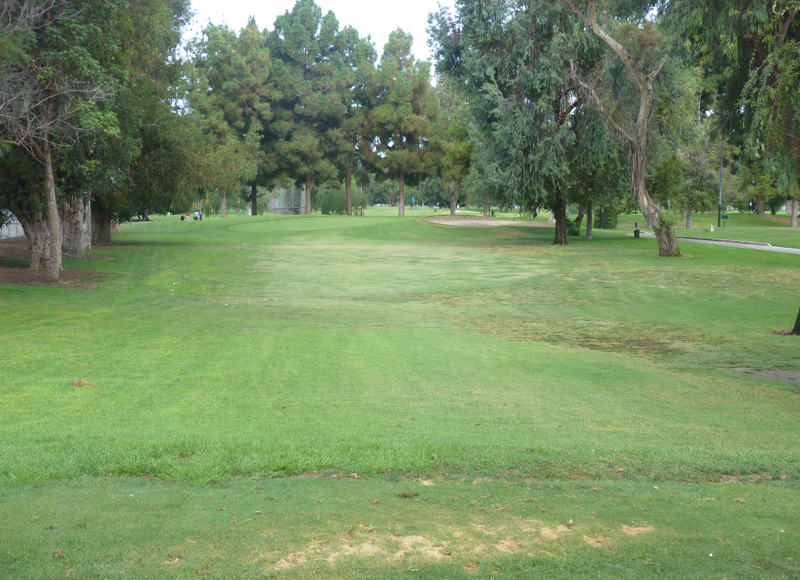 The grass is cut well on both the fairway and rough. The tee boxes are good and the greens are flawless. The greens are great – really good size and nice condition. 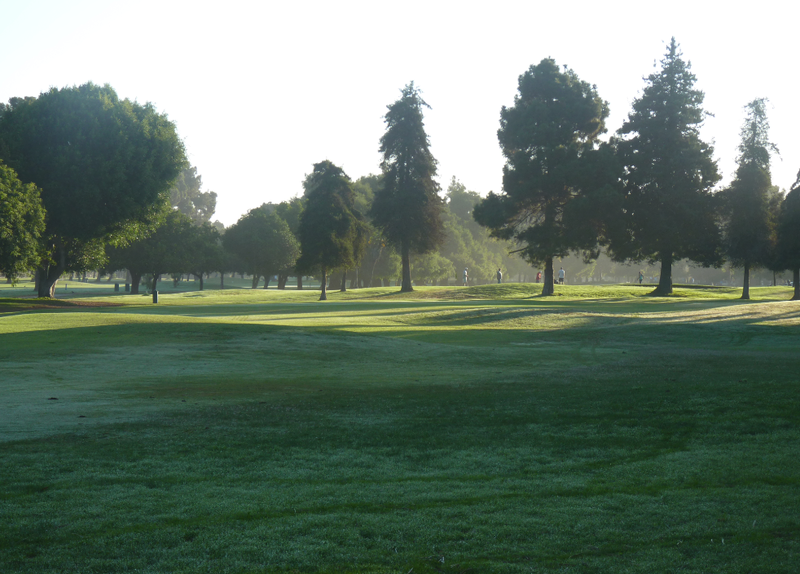 They run a little slower than other courses in the area. But that is a plus for me, as it makes putting easier. 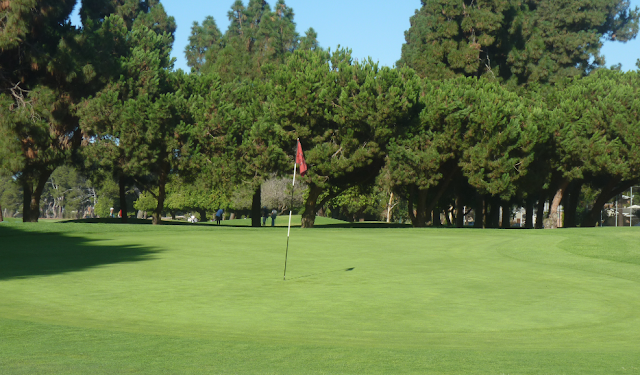 The greens are generally flat, with slopes or breaks. Heroes golf course is a 9 hole par 3 golf course located at the West LA VA Hospital. It is just off the 405 freeway at Wilshire. You have to drive through the huge VA campus. 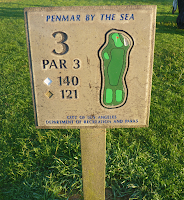 The course is well signposted, so it was not all that difficult to find. Once there there is a dirt parking lot and the starter office is in a small shed with a corrugated iron roof. The whole area looks like a set from MASH. 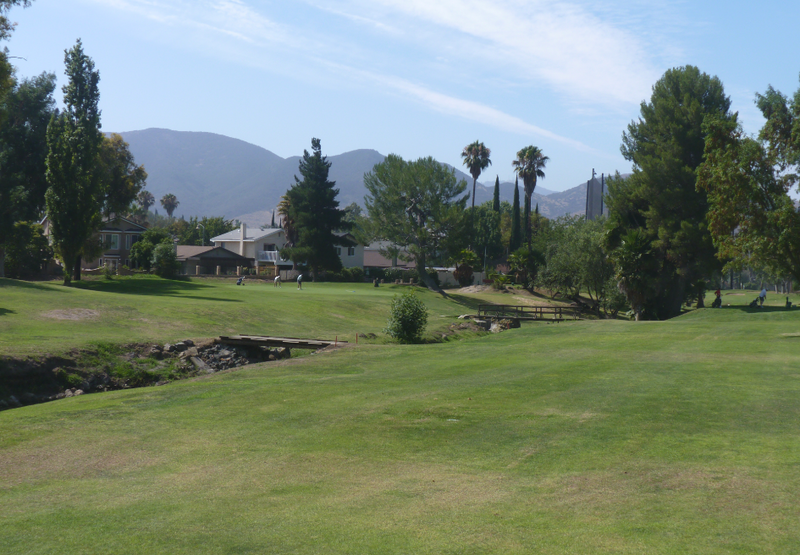 This is the second VA course I have played, having played a couple of times at Mission Hills previously. 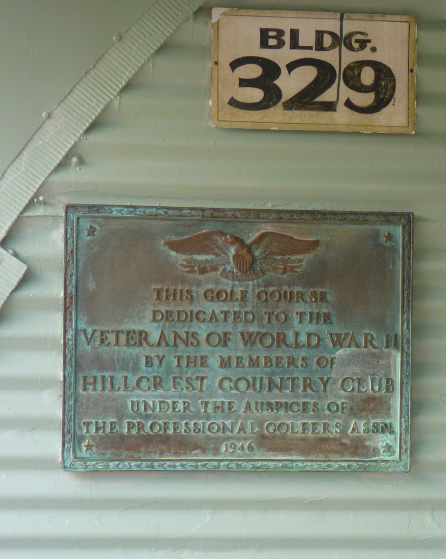 If you are a veteran than there are big discounts to play here (you get $5 off). If you are just a member of the public it is $13 at the weekend. 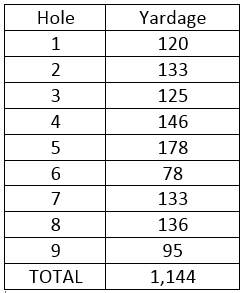 Which is an average rate for the area. The course is quirky. I say that as the layout is really disjointed and does not flow well. 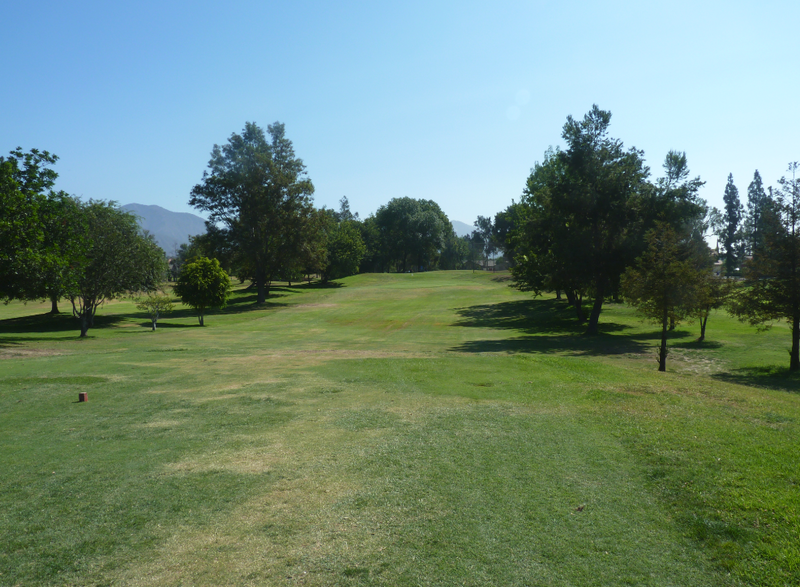 From hole 4, you have to walk back to where you started the hole and the fifth tee is just to the left of it. There are several instances of this kind of thing throughout the course. 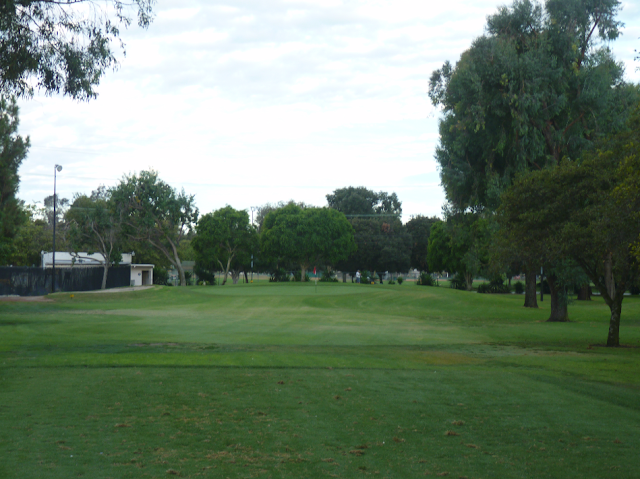 The course is also very open with all the holes kind of mingling together. It may be a little hectic if the course was busy, but when I was there it was not – so this was a non issue. The course is pretty basic. There are a couple of tiny sand areas in the whole course and that is about it. The greens are small and grass long, so run slowly. However they seem to be in decent shape. The fifth hole is the longest on the course – 178 yards. The rest are around the 120-130 mark. 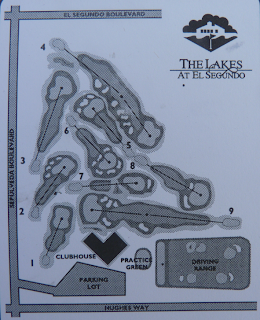 The ninth hole is interesting. It is just 95 yards long, however you have to hit over a ravine. With the greens being small, the course can be challenging to play. The course is average in condition. 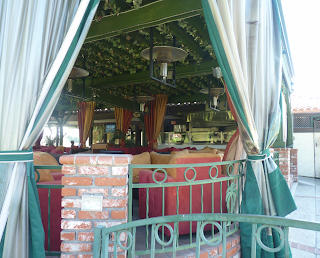 The staff work very hard on maintaining it, but they are working with a limited budget. The staff were friendly and the greens-keeper even asked me to take a photograph of his dog, which I obliged. I went at sunrise and the course was smothering in a marine layer from the nearby Pacific Ocean. 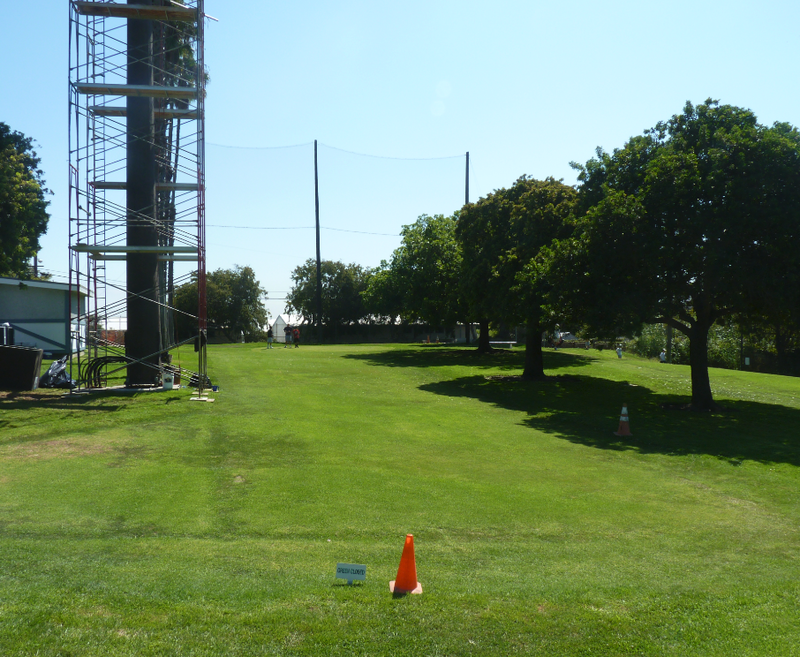 It added a kind of enchantment to the course, which you can see from the pics below. 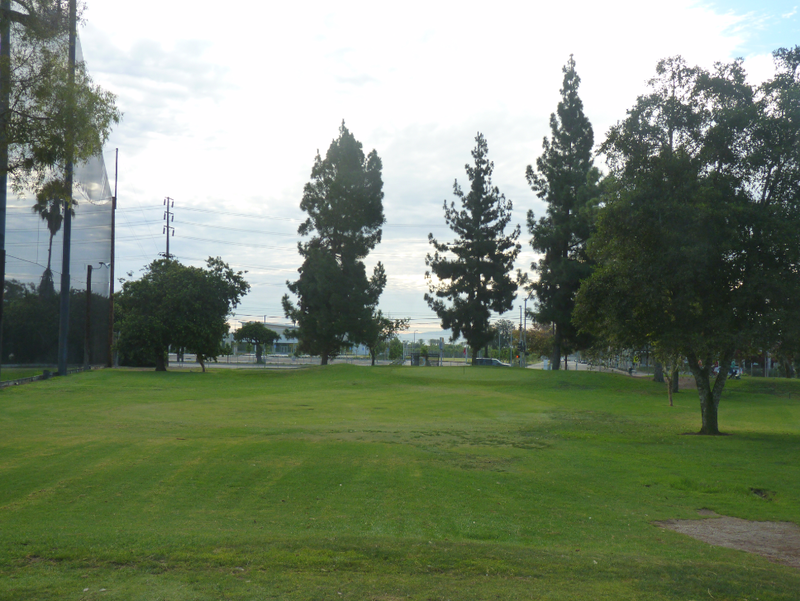 Norwalk is a 9 hole par 3 golf course. It is located in the City of Norwalk which is about 15 miles south of Downtown Los Angeles. From the 5 freeway, exit Rosecrans. 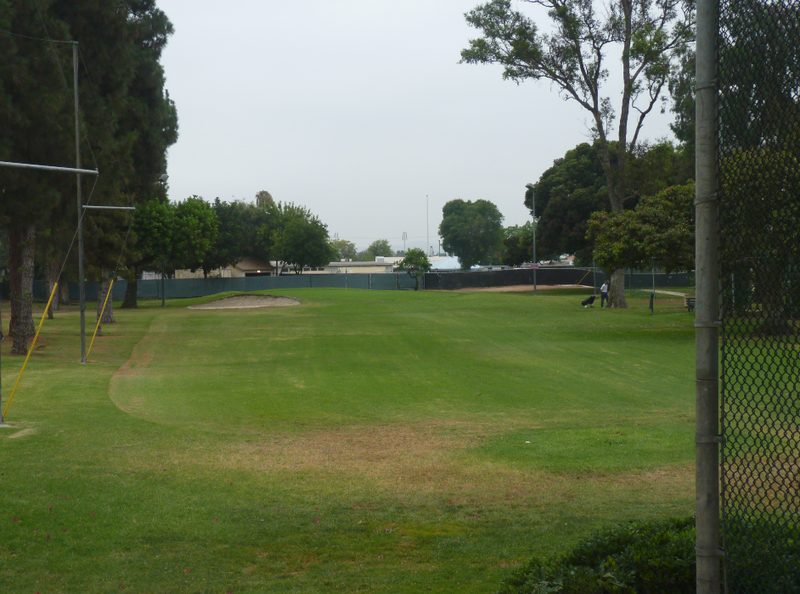 The course is visible from the road and pretty easy to find. There is a large parking lot with plenty of parking. The starter was very friendly. 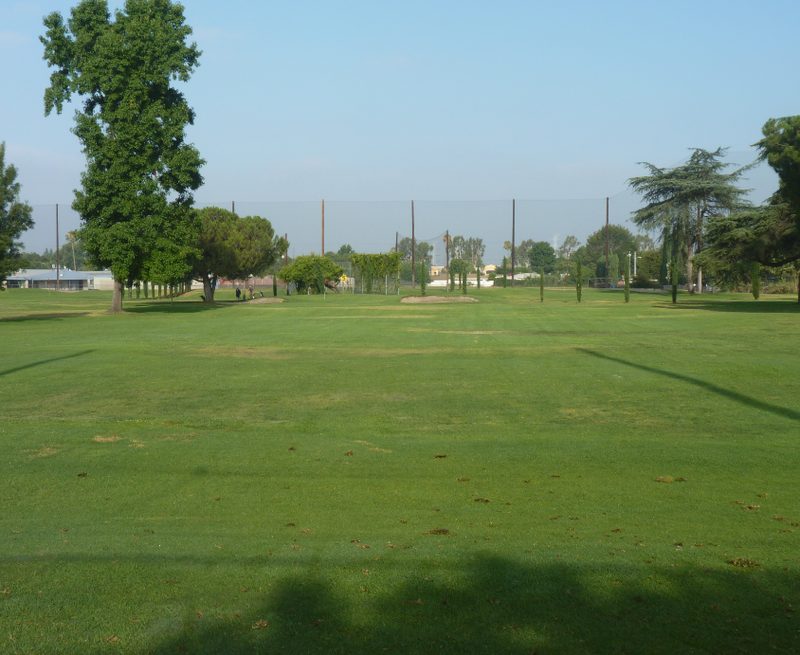 There is a practice putting green, small driving range (about 100 yards long with 6 stalls). There is no cafeteria or bar on site, just a fridge with some drinks for sale. I was told by staff that on Friday evenings (summer months only) they bust out the grill and barbecue food for people at the course. 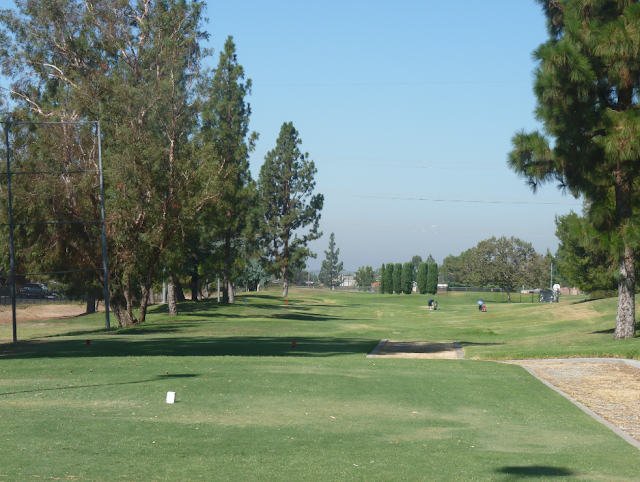 Norwalk is a great value – just $7 to play 9 holes; $4 for a replay. 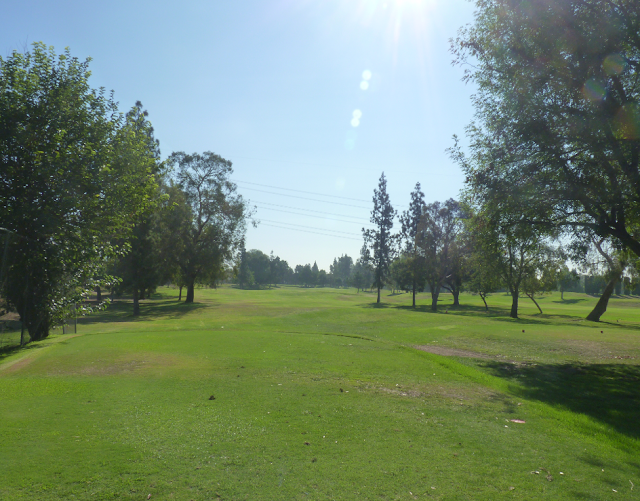 The course itself is great and fun to play. 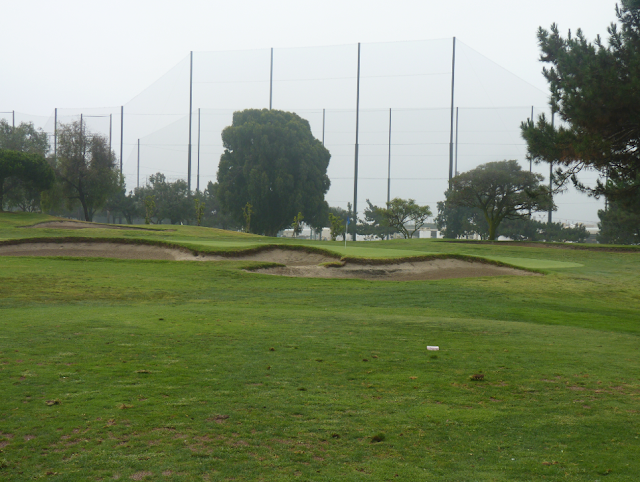 8 of the 9 holes had sand traps. 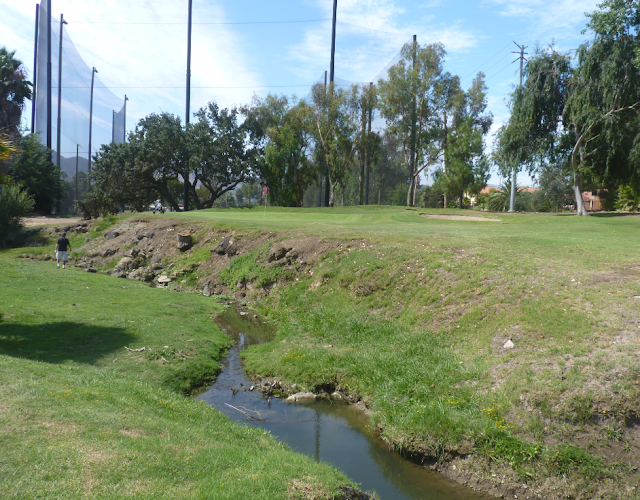 There is also water which comes into play on hole 9. 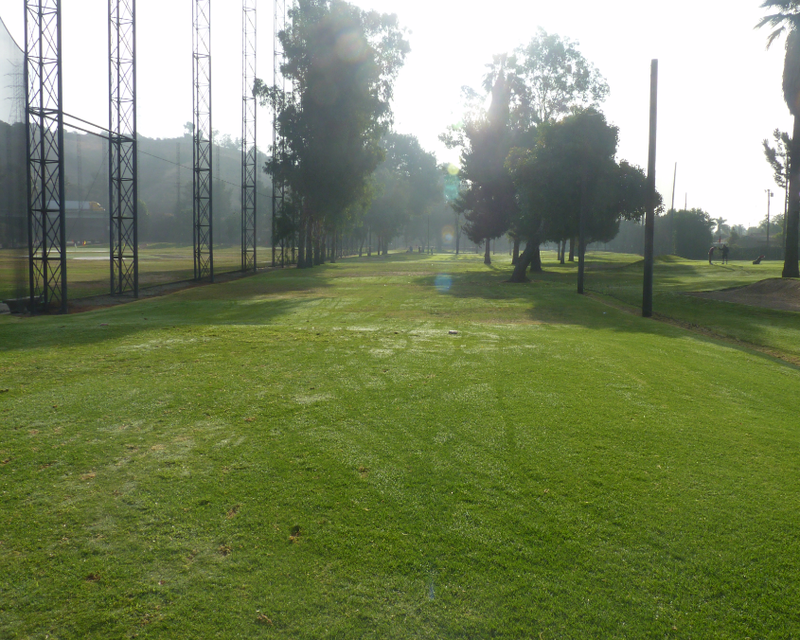 The longest hole is 140 yards, but the others are around the 100-110 yard range which makes it good for beginners. Each hole has variation and the design is very good. 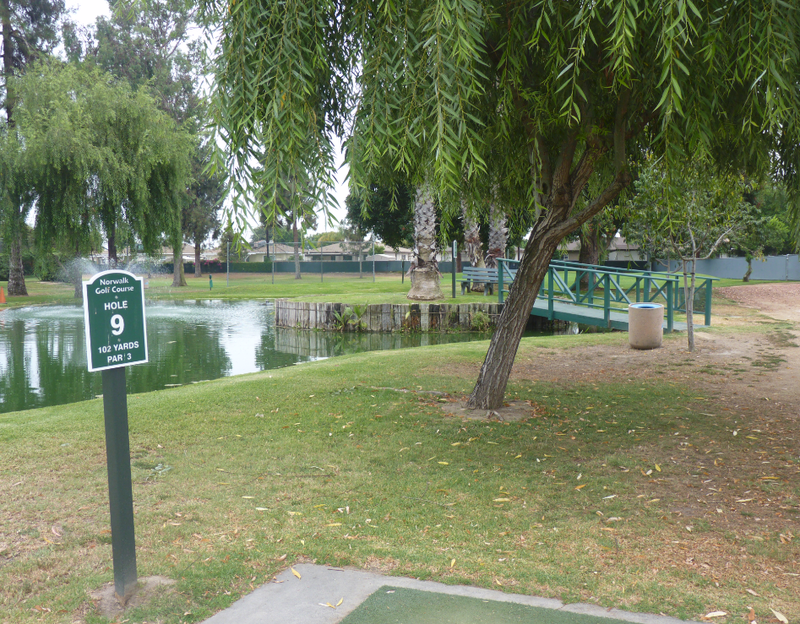 Hole 9 is 140 yards and you have to tee off over a small lake (pond). 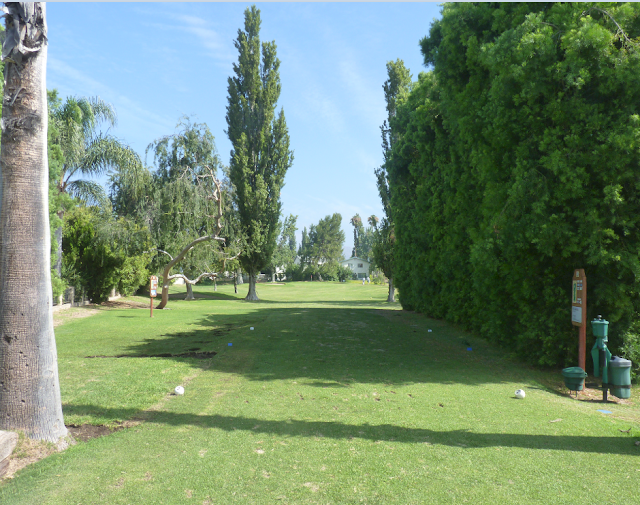 There are three tees which makes the hole playable for people with all abilities. 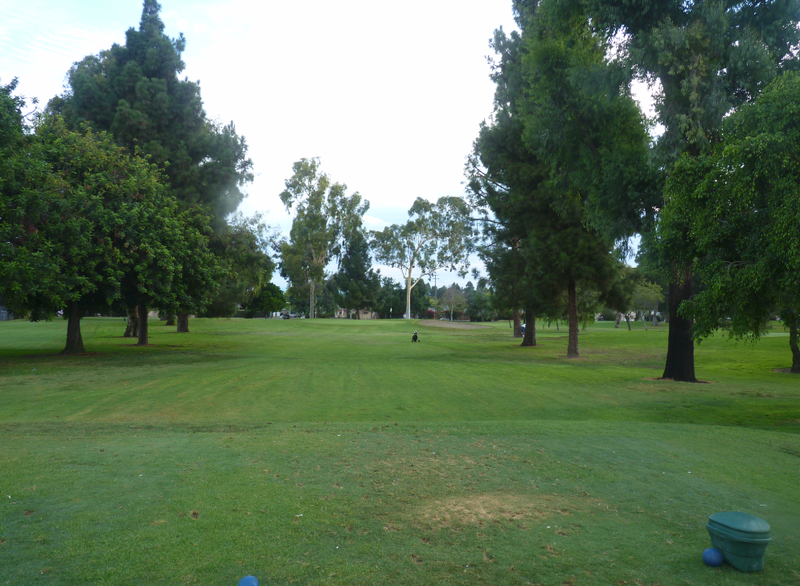 The greens at Norwalk are a nice good size and really well maintained. They have undulations and run really well. 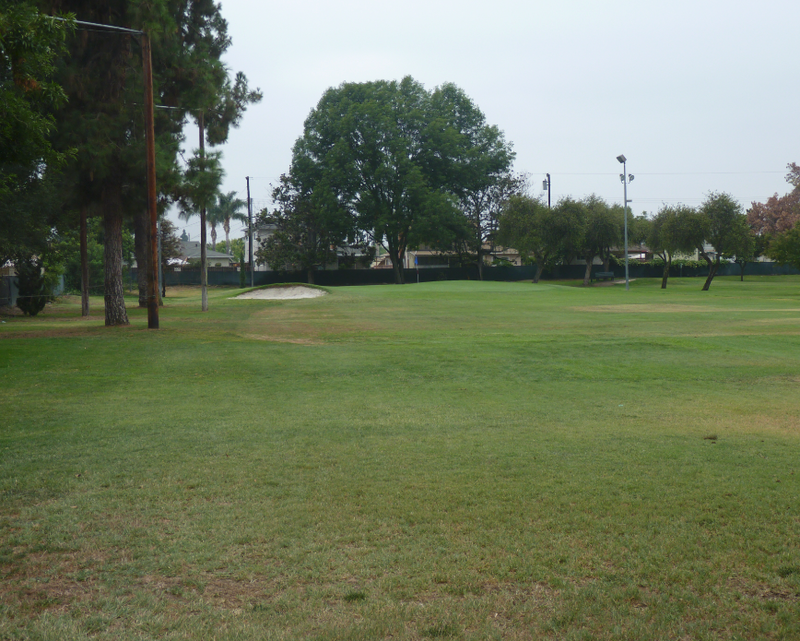 When I played there was not a pitch mark or defect on any of them. 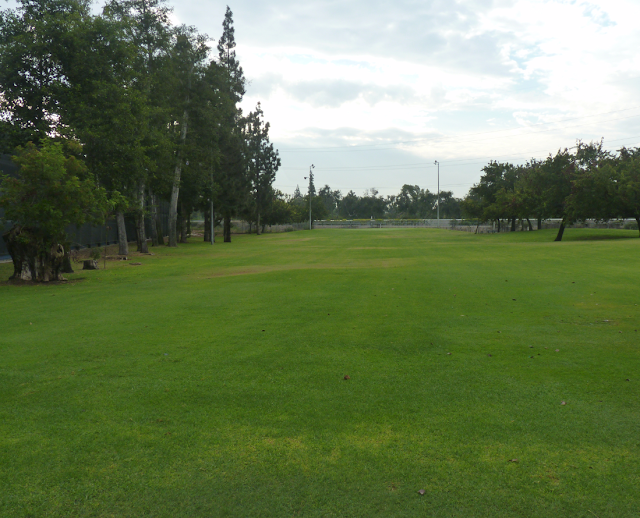 The grass throughout the course is very good. 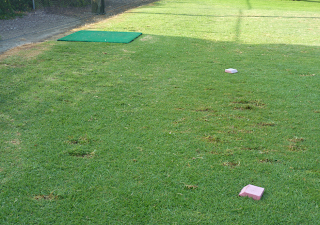 You tee off mats and tees are provided for both right and left handed golfers. 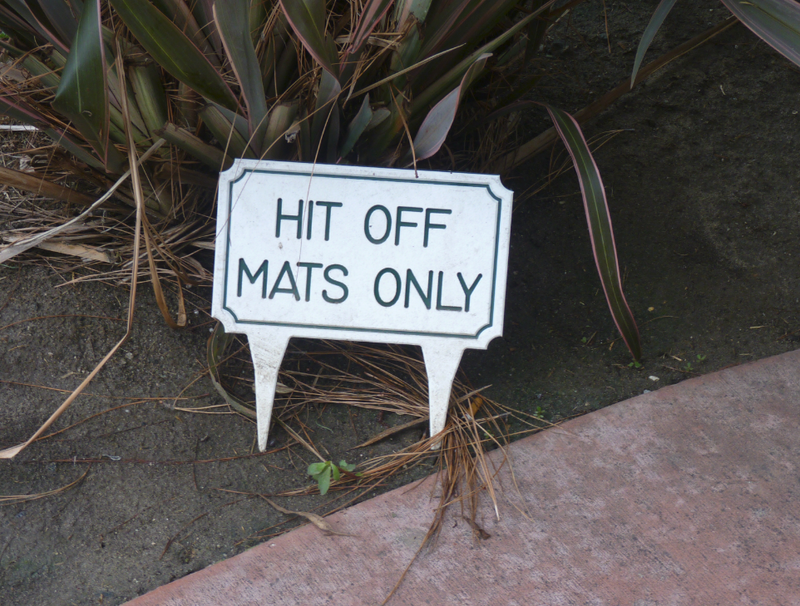 The mats seem to be in good condition. 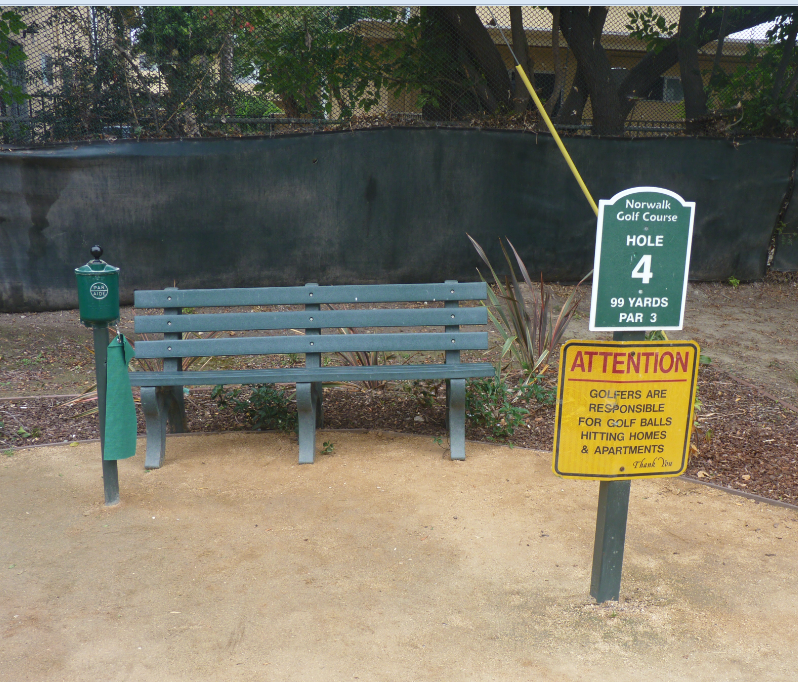 Also each tee box has a bench and ball washer. All of which is in great shape. 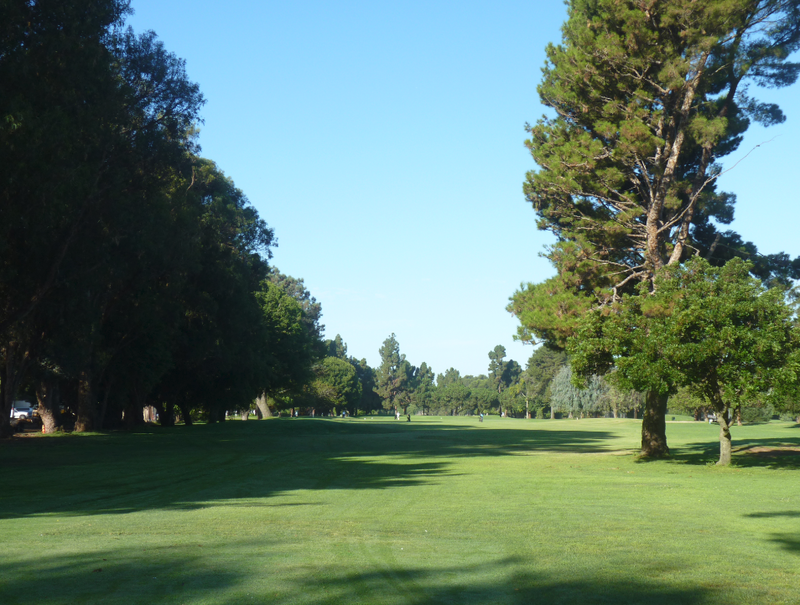 It is remarkable to find a course so well maintained for so little money. 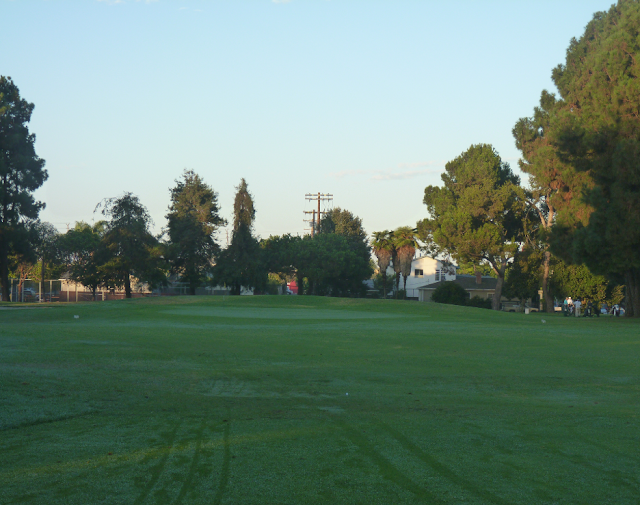 I have to say that Norwalk Golf Center is the best course I have played in the Los Angeles area for under $10! My only issue with Norwalk was with the maintenance guys. On two occasions when I was on the tee box and getting ready to take a shot. The maintenance guys then moved onto the green to water/ cut the grass. I had to stand and wait for a few minutes. They really need to let the golfers play and wait until I was finished. Especially as there was no other group directly behind me. The pace was good and everyone when I played were playing at a good speed. After I had finished playing I chatted to staff. They told me during the week it is quiet, especially mid-afternoon. I was told that the busy time is on Sunday. So I would recommend avoiding Sunday if you wish to play here. They have lights throughout the course, however close pretty early (7pm). I presume the lights are mainly used for winter months when it gets dark earlier. 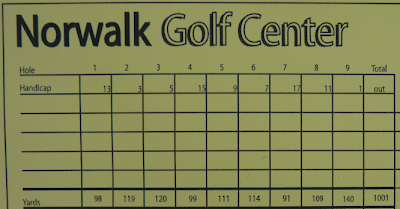 This course does not require you booking tee times. Just show up and play. 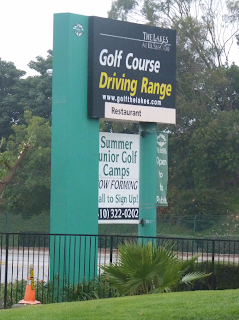 Note the course is reserved each Saturday 10am-noon for the Junior Golf Academy. 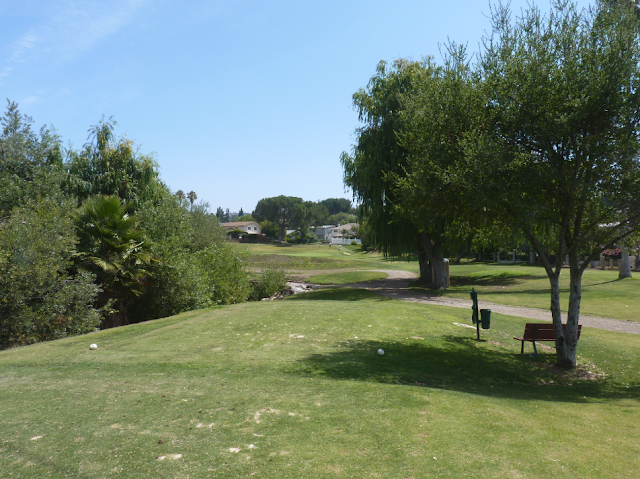 The Lakes at El Segundo is a short 9 hole executive golf course. 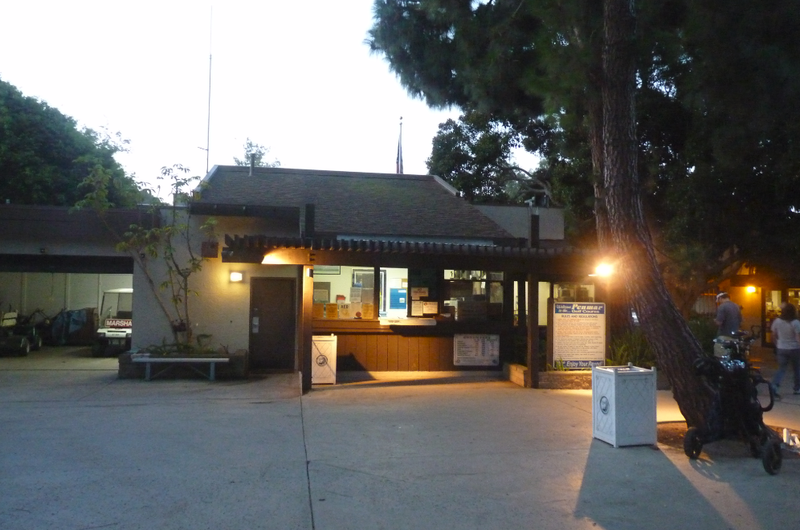 It is located off Sepulveda Blvd and about 5 minutes south of LAX. Which makes it convenient if you have a long layover or staying at the airport. 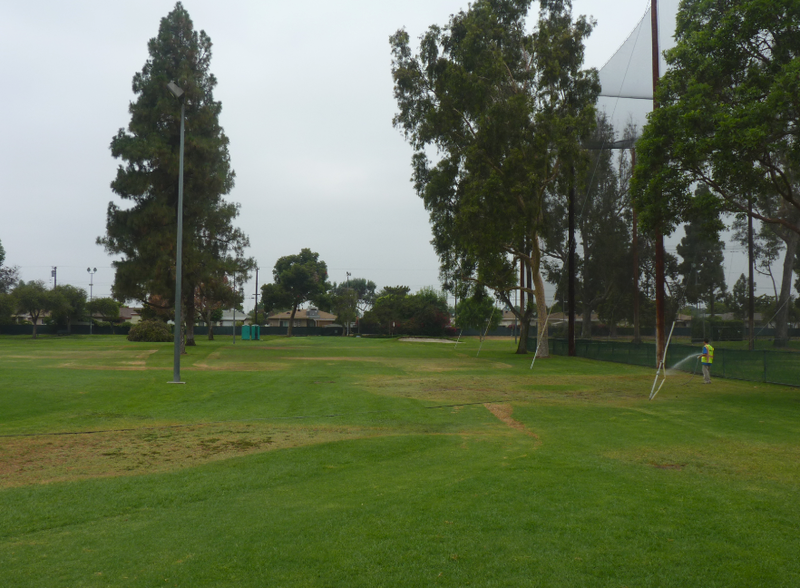 They have a full practice center here – driving range, putting green and chipping area. 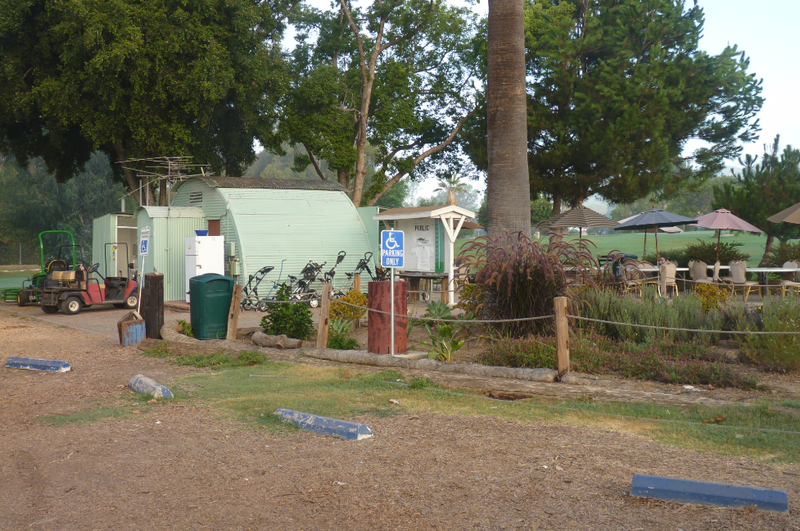 There is a small pro-shop and a cafeteria on site. 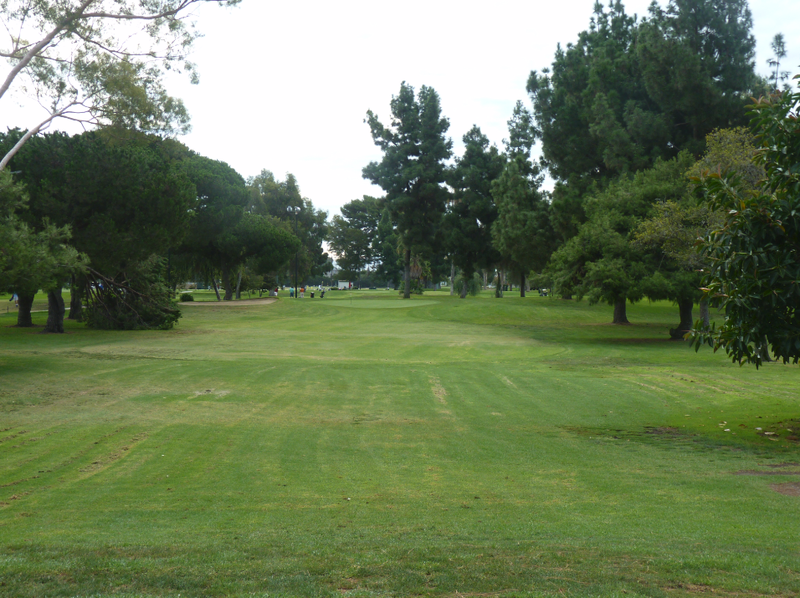 The course itself is 1,340 yards in length. 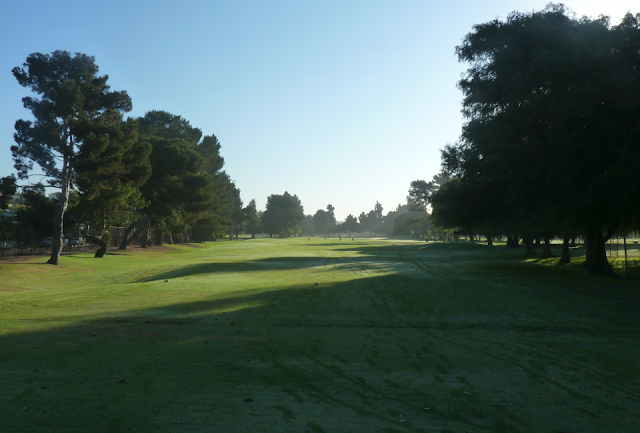 There are two short par 4’s (around 260 yards) which make the course a par 29. The course is well designed. It occupies a relatively small area, but the holes fit well into the footprint. The holes are close together, but are cleverly designed in a way so that they run in different directions and you are not on-top of people playing other holes. 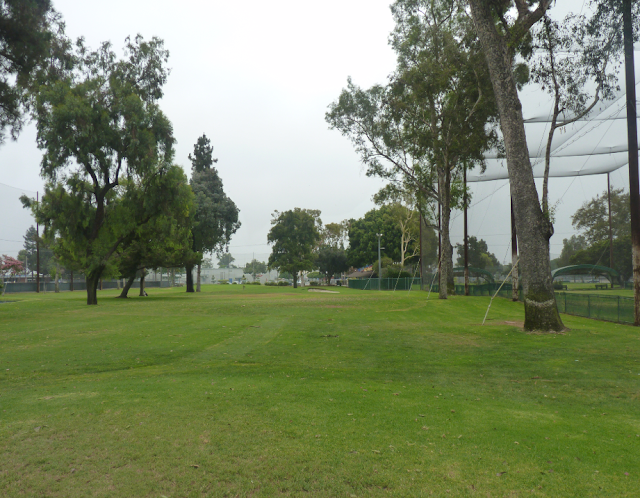 The first three holes run parallel with Sepulveda Blvd., then you head east out into the course. There are plenty of bunkers spread throughout the course. Some are challenging and in all the sand seemed to be good and not too dense. 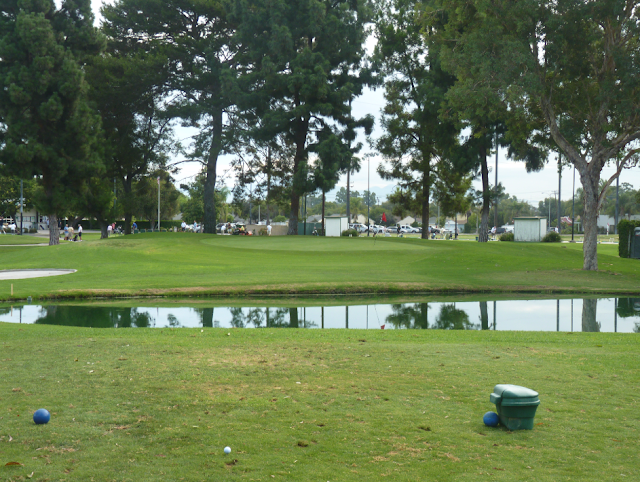 There is some water which comes into play in about 3 of the holes. Kind of surprising considering the name. I was expecting a lot more water and actual lakes. 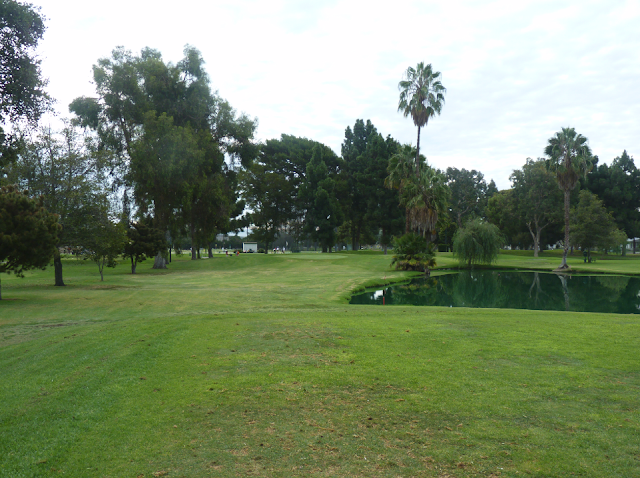 Where is reality there are just two small ponds out on the course if I correctly recall. 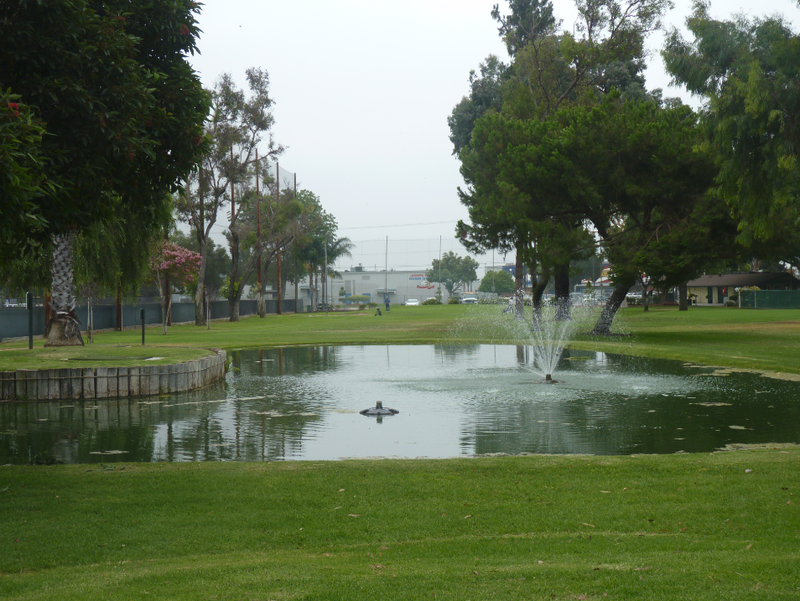 May be The Two Ponds at El Segundo? The holes had good variation and some nice elevation changes. I particularly liked hole 7. 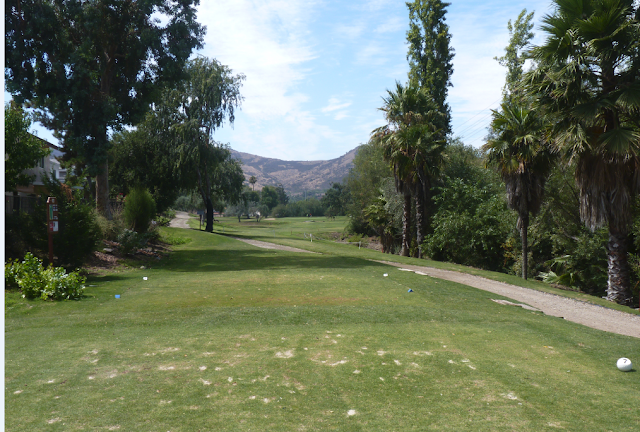 This was a short 103 yard par 3, where there is water in play if you hit right. 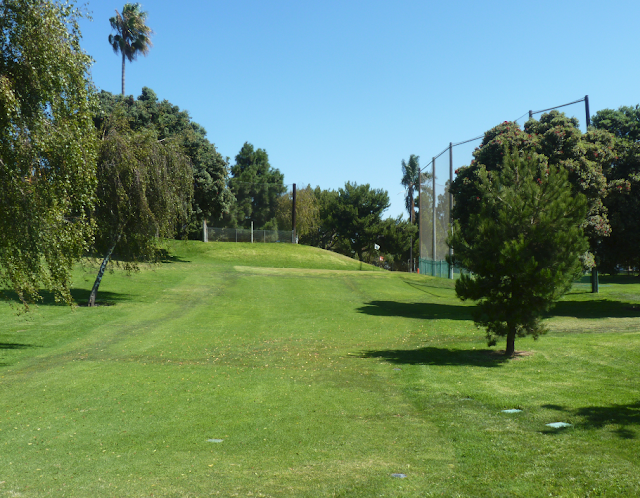 Hole 9 is a 261 yard par 4 hole. For some reason there is a sign saying you can use irons only. I think it may be as a precaution in case someone launches a 300+ yard drive towards the club house. 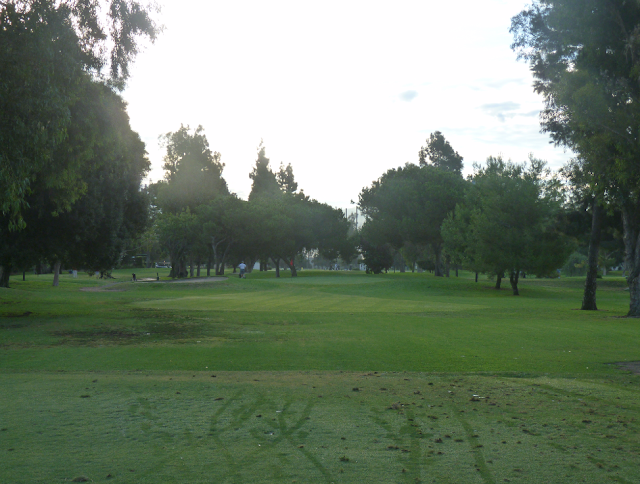 The course was in very nice condition. 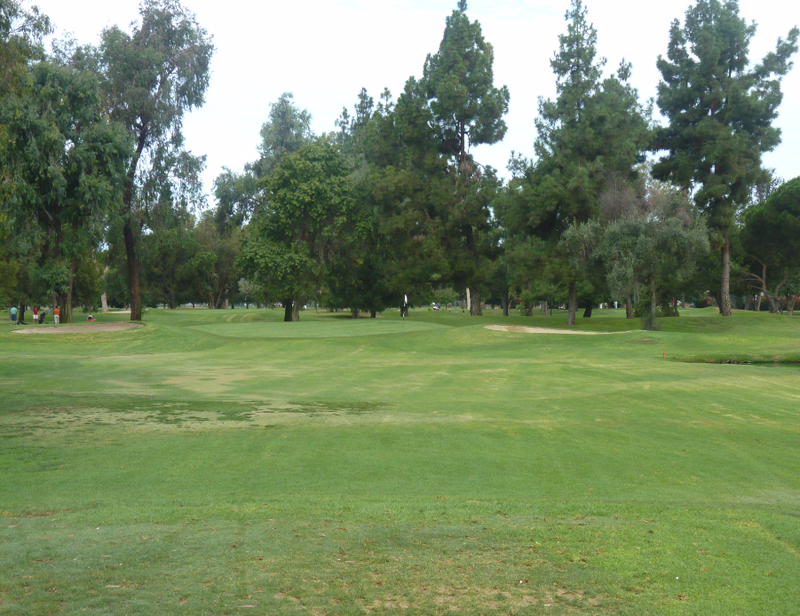 The greens were large and ran fast. The grass was green and the tee boxes were also in good shape. You hit off the grass and there are no tee mats on this course which is a nice bonus. Being close to the ocean it was nice and cool. We played early and the course was covered in early morning ocean mist as you can see in the pics below. 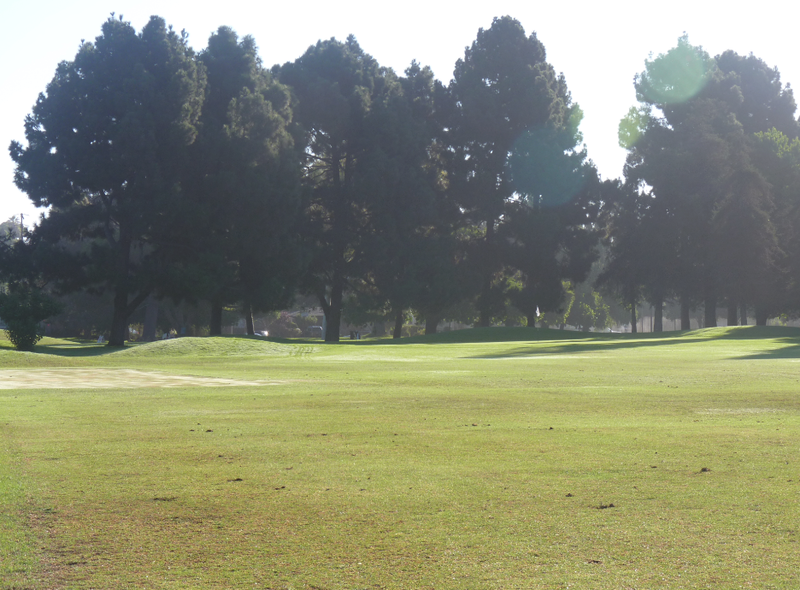 The pace was good and the course was quiet as we played early. I have been here at 10am on a Saturday though and it has been very busy. In all cases I recommend calling in advance and booking a tee time. They sometimes close the course for a few hours at a weekend to allow kids to play and do workshops. The ground-staff need to learn some etiquette. 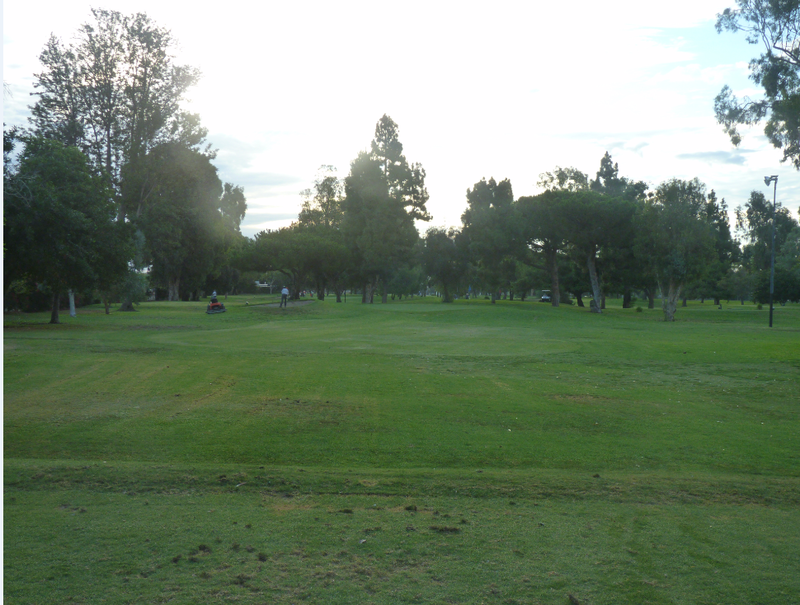 While playing the first hole, we had made our tee shots and were playing our second shots around the green. 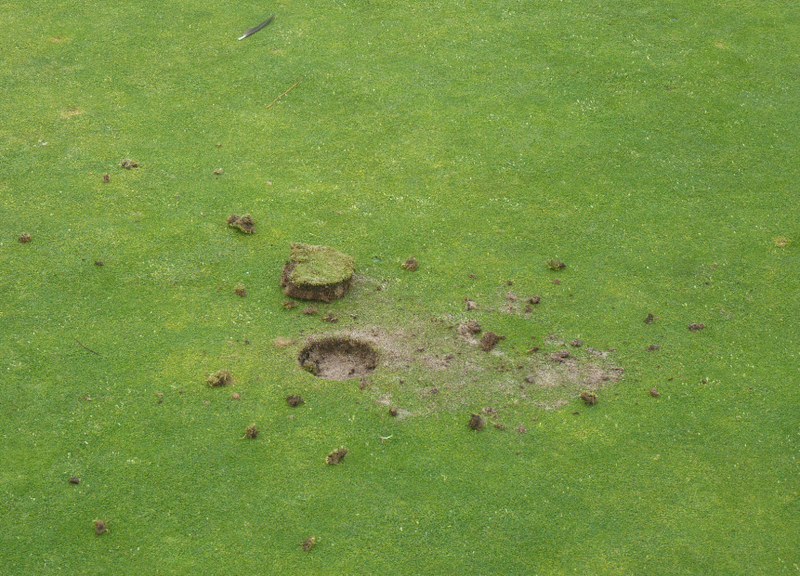 While doing a guy drove a cart right up to the green and started to make two holes in the green surface, presumably to move the hole. He then drove off to return five minutes later. In the meantime, my playing partner had a putt with a large hole right in his line. Not cool – they need to wait a few minutes for players to complete the hole before trying to make changes. Despite giving it 4/5 for design and condition, I am giving El Segundo an overall score of 3.5/5. $18 seems a little high for this short course. You do not get much golf for your money. Also there is really nothing here which makes it stand out from the rest. 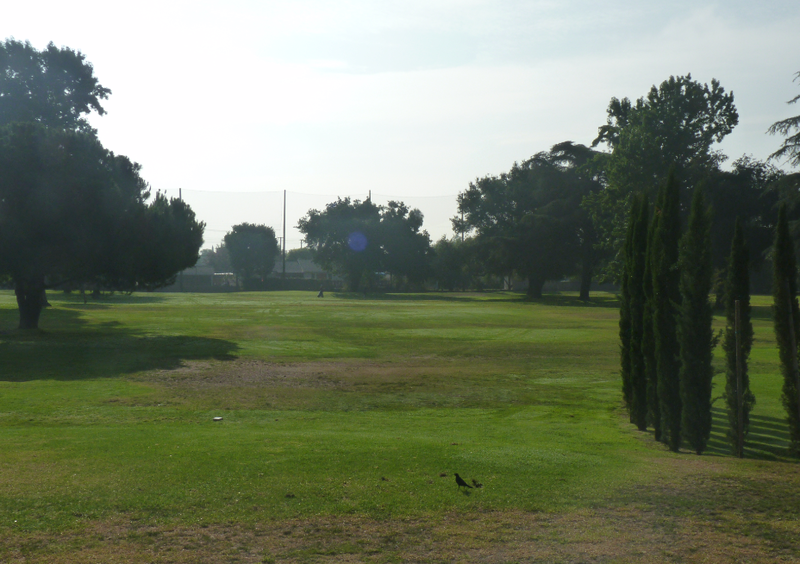 It is just another 9 hole golf course. This was cut out of the green as we were playing the hole. The staff then just took off to come back about 5 minutes later. Heartwell is a 18 hole par 3 golf course located in the North East edge of Long Beach. It is close to the 405, 91 and 605 freeways. 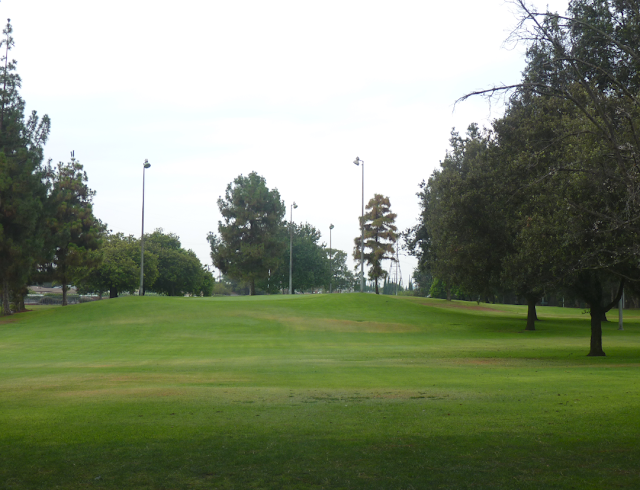 The course is fully lighted allowing play in the dark winter evenings. 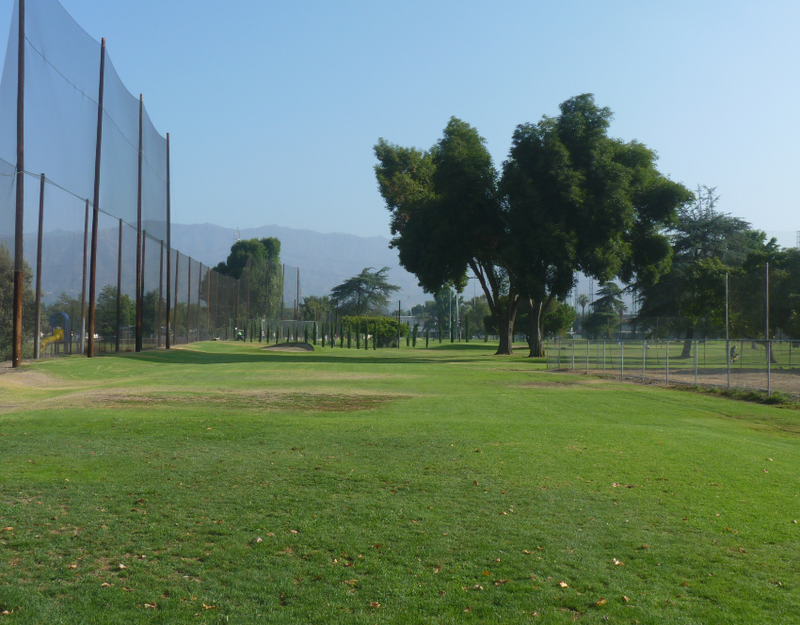 There is a full practice facility at the location, with the driving range having 35 stalls. 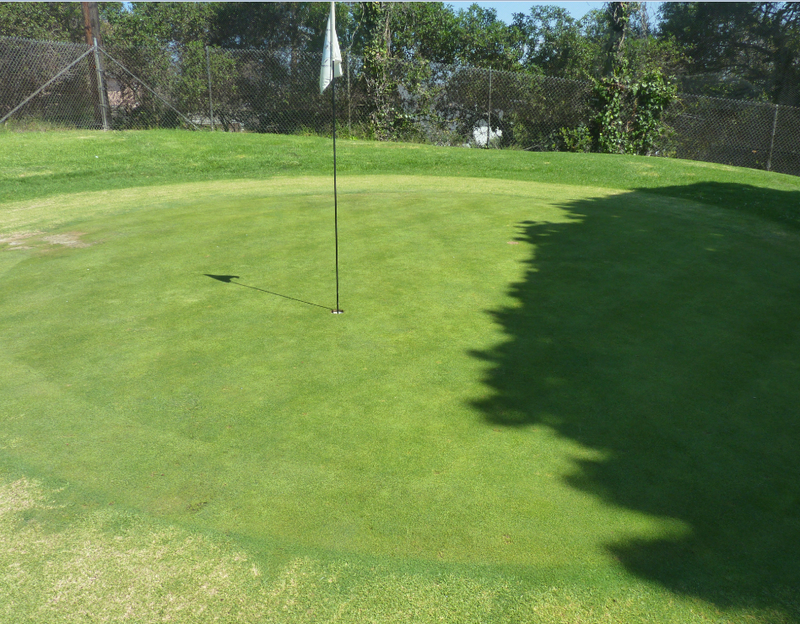 There are also practice putting and chipping greens. Heartwell is known as the course where Tiger Woods got started in the game. Four months shy of his fifth birthday Tiger got his first birdie and it was at the 91 yard, third hole at Heartwell. 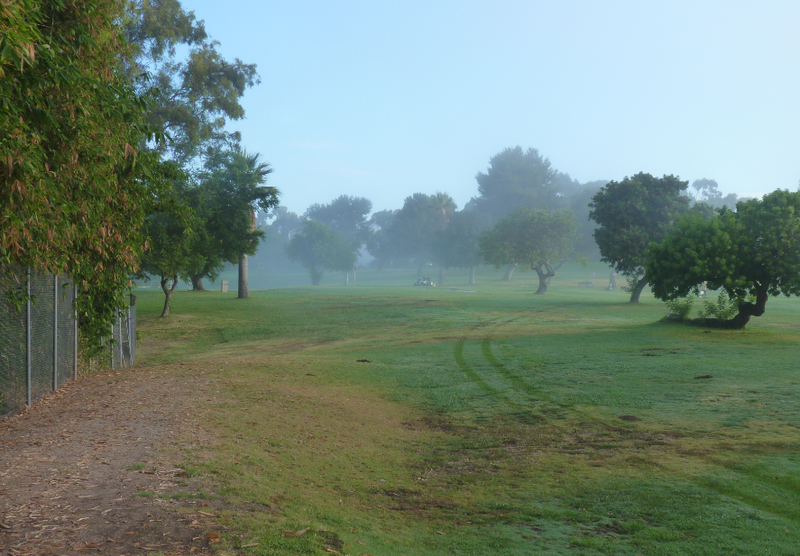 I went super early in order to zip around the course. So that I could get back home and take my significant other to IHOP for some German pancakes. However that didn’t work out so well. This course is busy and I mean really busy. 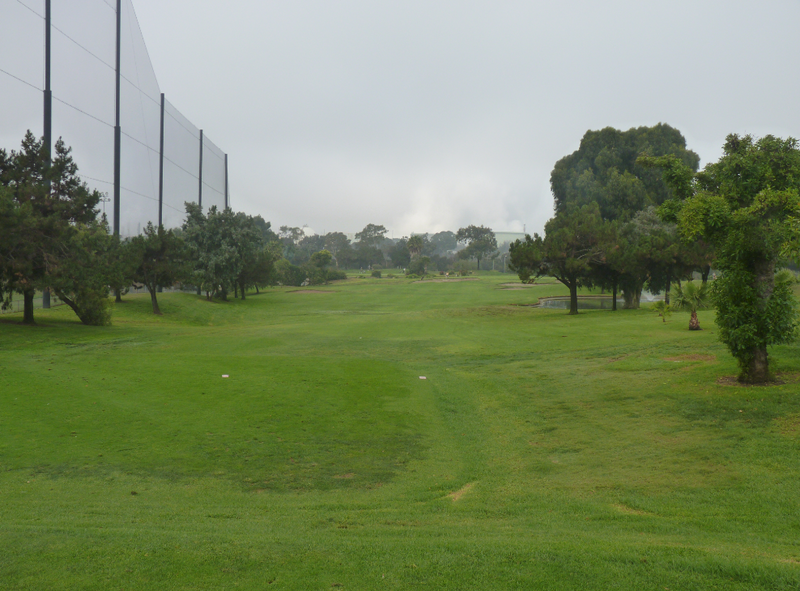 I started straight away and by the time I got to the 2nd hole I had to wait a few minutes at every hole for the rest of the round. 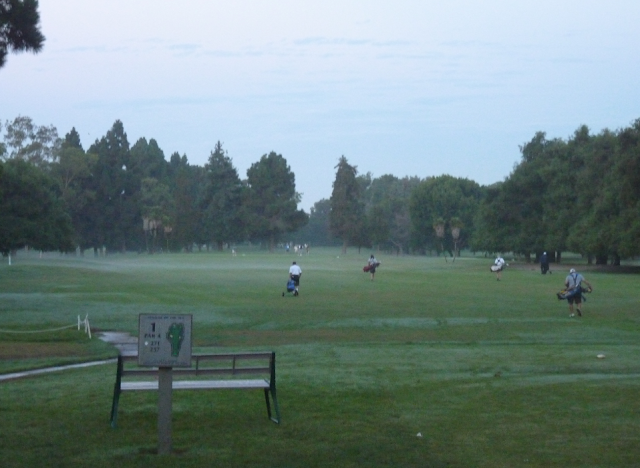 Now I teed off at 6.35am and it was not really fully daylight. When I finished my round (9am ish), which took about 2 hours 20 minutes the parking lot was almost full. 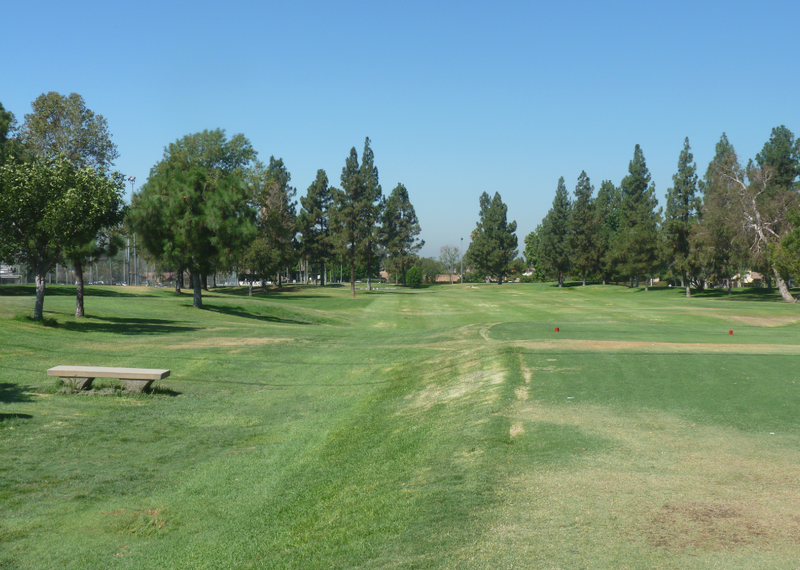 As I finished the last few holes and looked around I saw people all over the course playing. 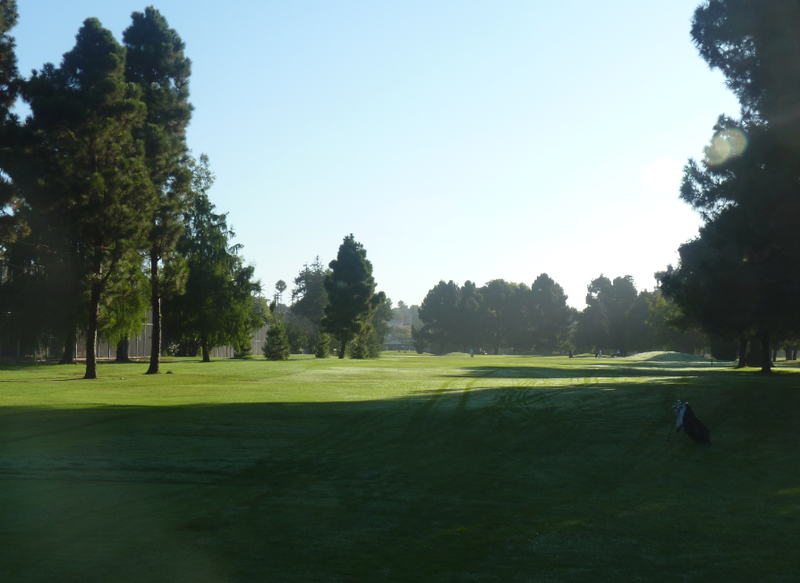 I was relieved I played so early and would hate to play 9am or later. For me the popularity of this course is a negative and it is reflected in my overall mark for the course. 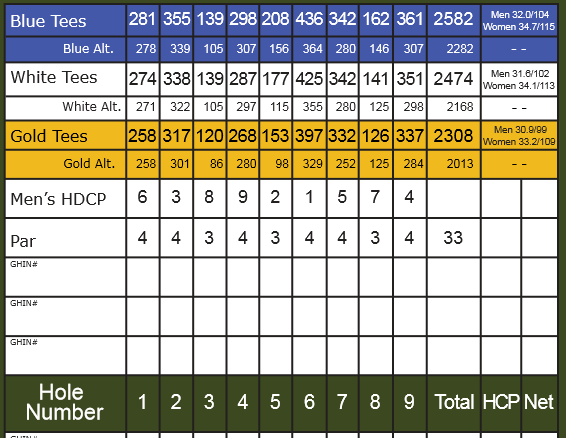 I was a little underwhelmed by the front nine holes. 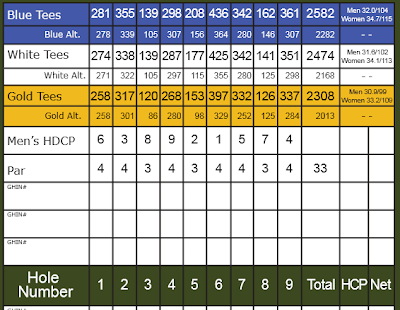 They all seemed a little generic and all at the same yardage range. 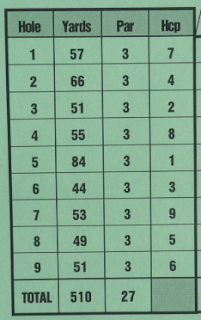 The back nine was a great improvement. 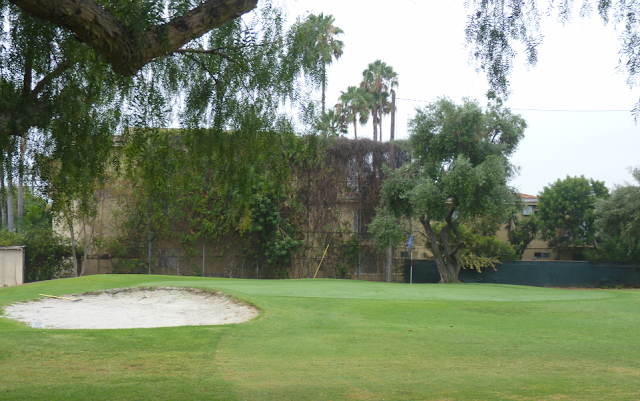 The holes were designed with more variation and the yardages varied.Almost all of the holes (if not all) had a greenside bunker. 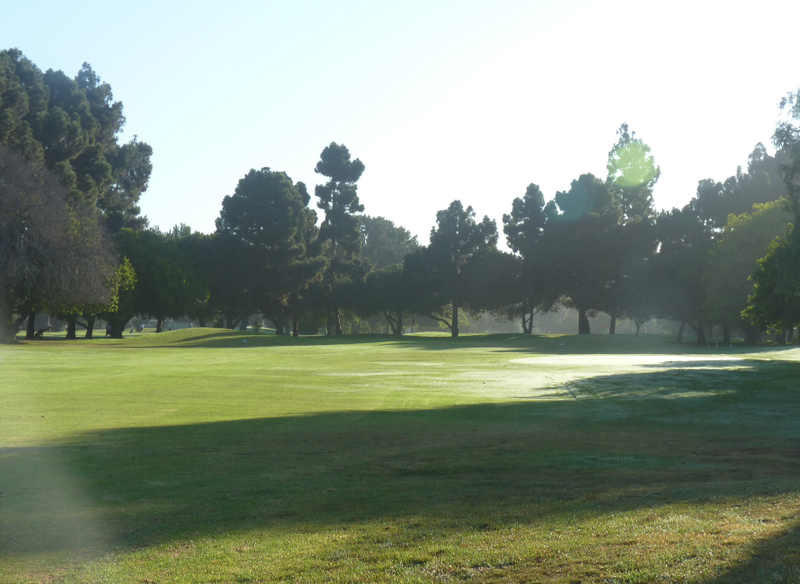 There was a little water on the course which came into play on hole 14 and 18. One of the most enjoyable holes was hole 12. It is only 85 yards, but has a deep bunker at the front of the green and a small green; so you have little room to work with. 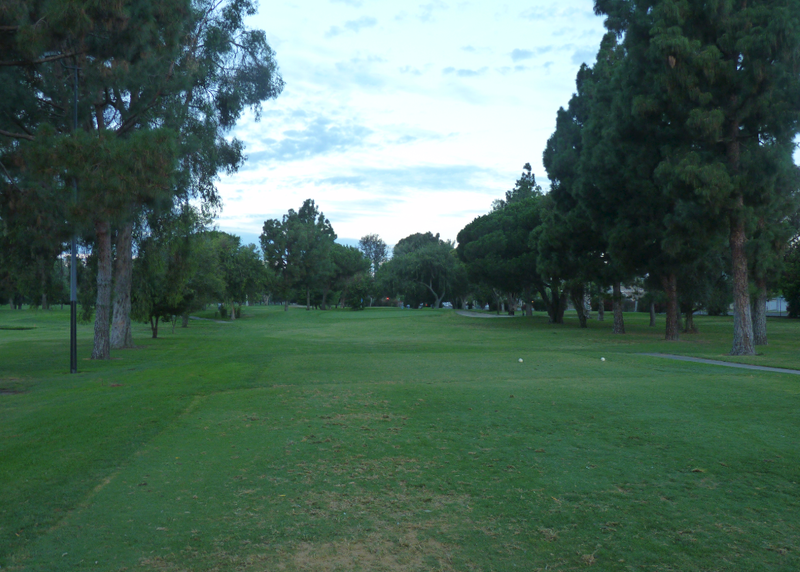 In fact the best stretch of the course for me were holes 11 to 14. 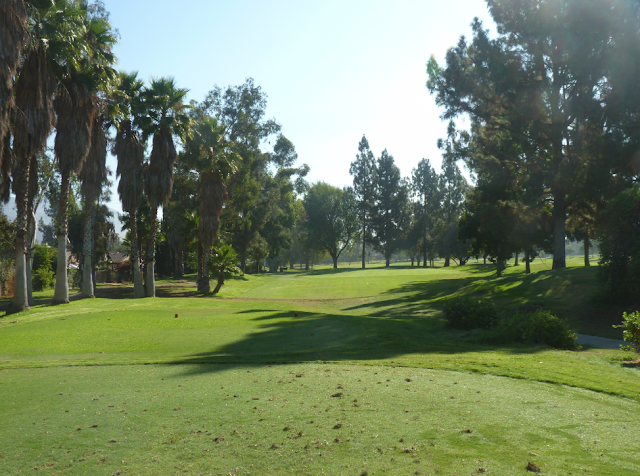 They were short, but as often the case the short holes are the most fun to play. I did notice an error on the scorecard. Hole 8 is down at 140 yards. But in reality it is about 115-120 yards. The course was relatively easy to play. The longest hole is 140 yards, so you only need to bring a wedge, putter and a couple of short irons with you. I brought just four clubs and did just fine. Many of the holes were straight with little danger. Therefore making it a good choice for beginners to play. 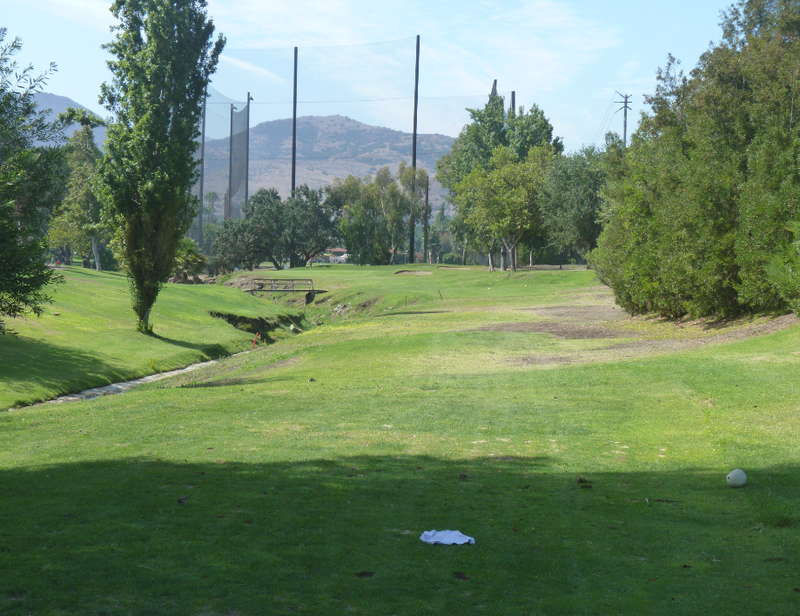 Where there was water, the shot to play over it was short – may be 70 yards. 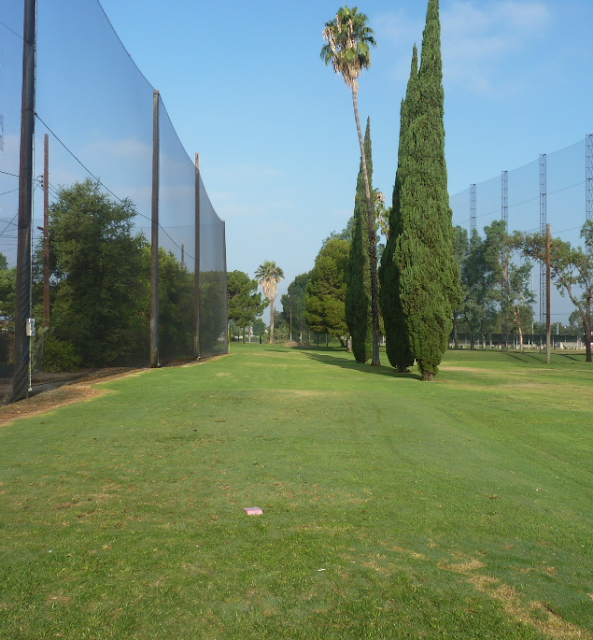 You do not have to hit 180 yard shots over water like at Manhattan Beach! 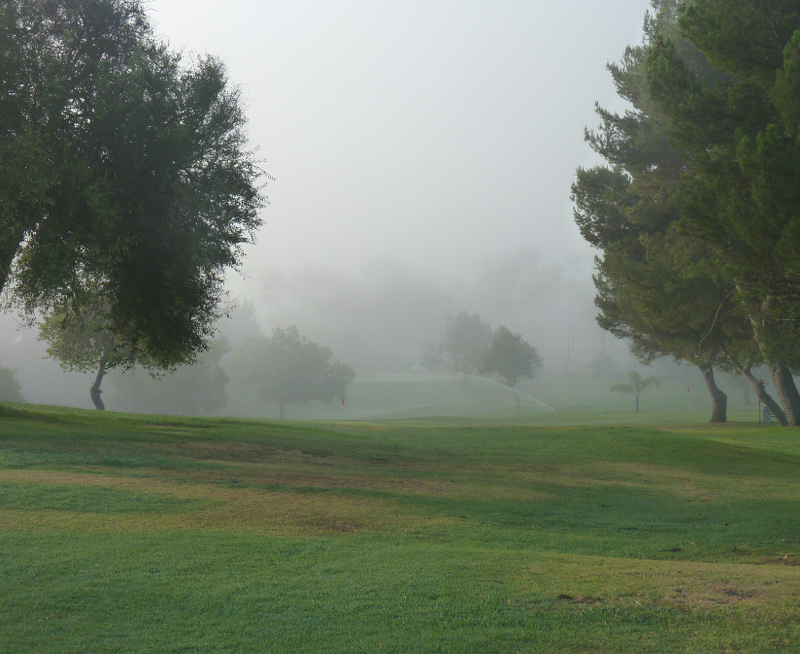 I did find it a little tricky at times to navigate the first few holes of the golf course. 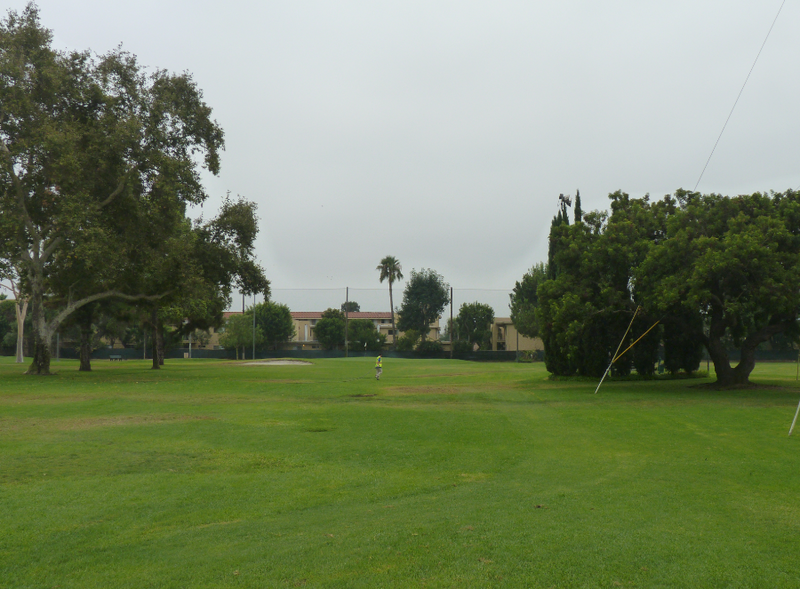 The holes were not clearly marked and some had no tee markers at all – especially on the front nine. 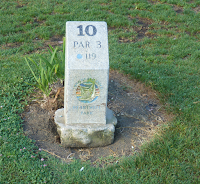 The tee markers were small stones and not all that large. Some were covered by nearby foliage. There were some ball washers out at the tee boxes, but not on every hole. 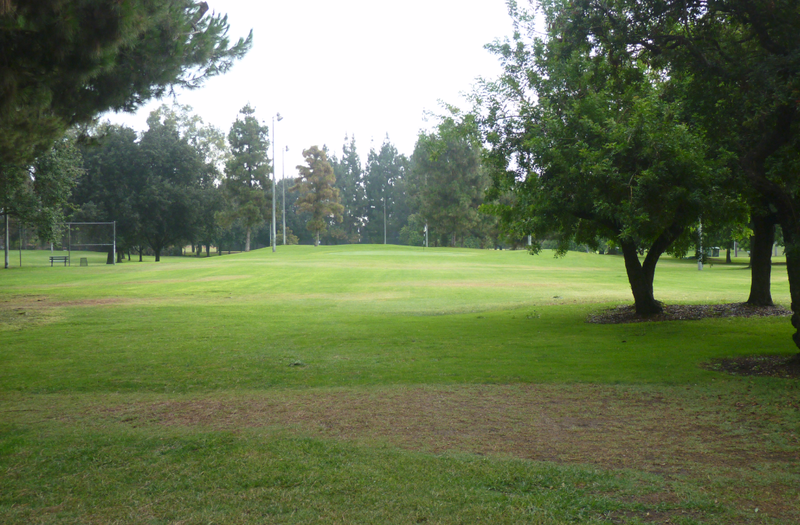 The course was in really nice condition for a public course. 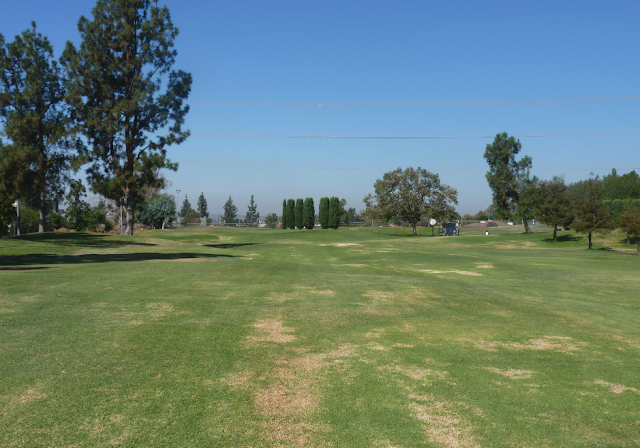 The grass was well watered and you hit off regular tee boxes – not mats. 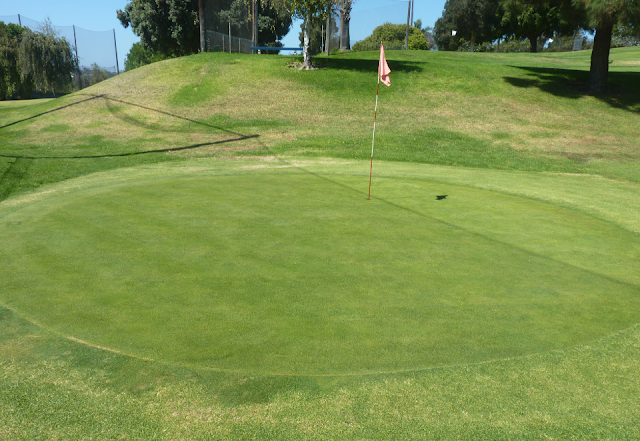 The greens were of good size, although it did seem as the round went on the greens got smaller. 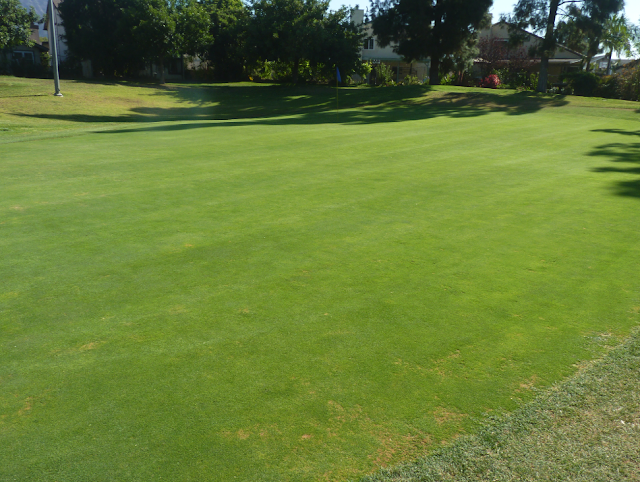 The greens were soft and did not run all that fast. Which I liked and made a nice change as with the heat recently greens have been running ridiculously fast. 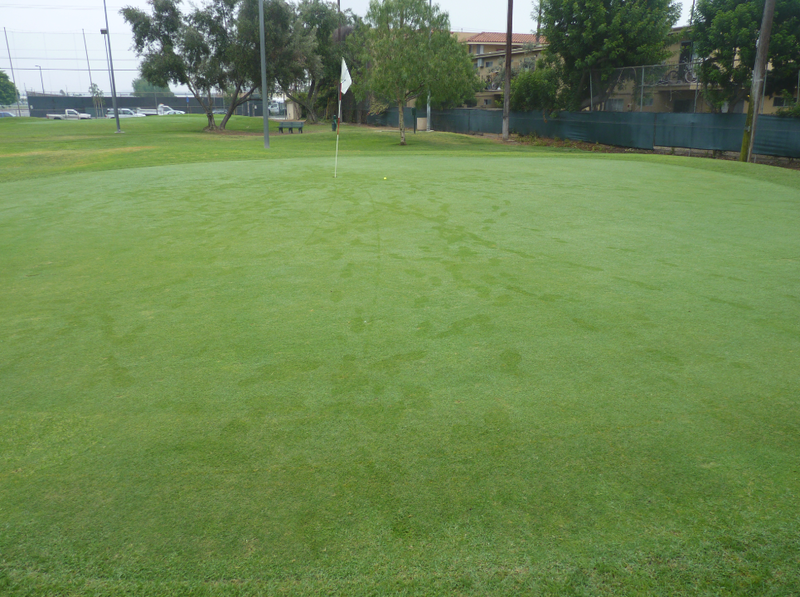 I did notice however that a lot of the greens had pitch marks which were not repaired. 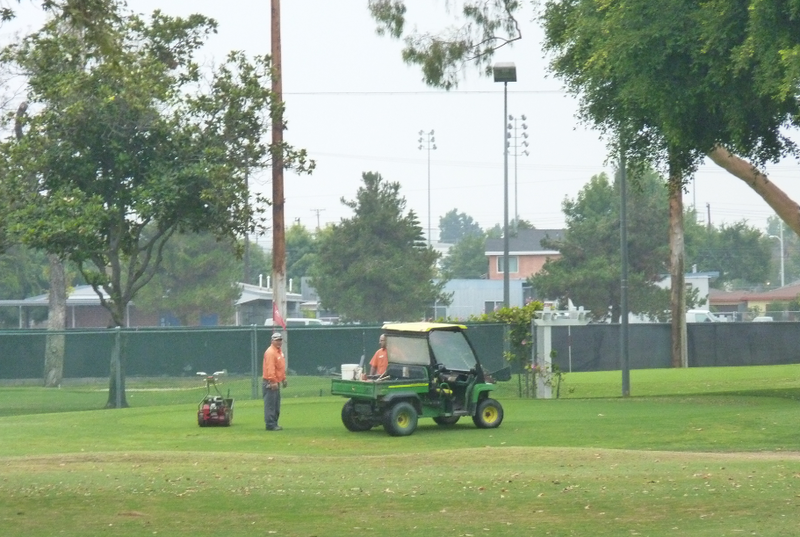 The maintenance guys were out working on the course and waited while you played the hole, letting the game flow. They did not storm onto the green while I was in the middle of playing it. Take note Norwalk and El Segundo! They do have golf carts available to rent which is rare for a par 3 course. 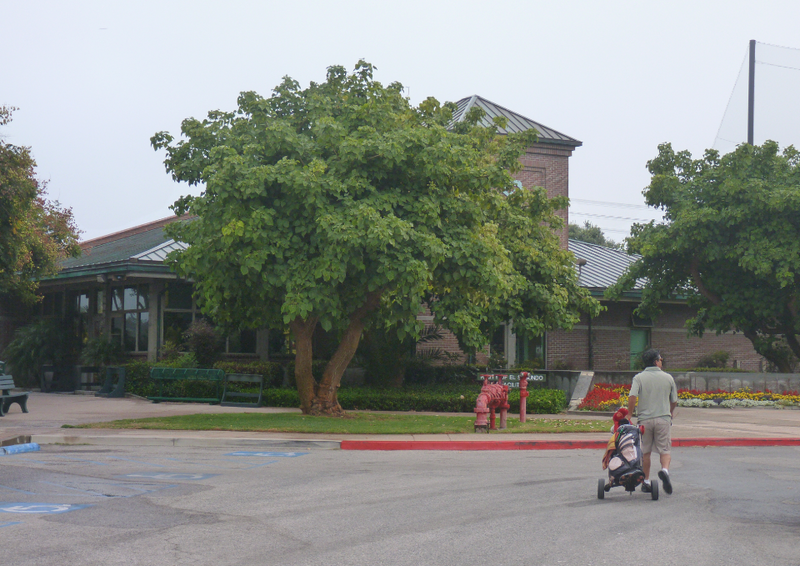 This makes Heartwell good for seniors or those with walking difficulties. 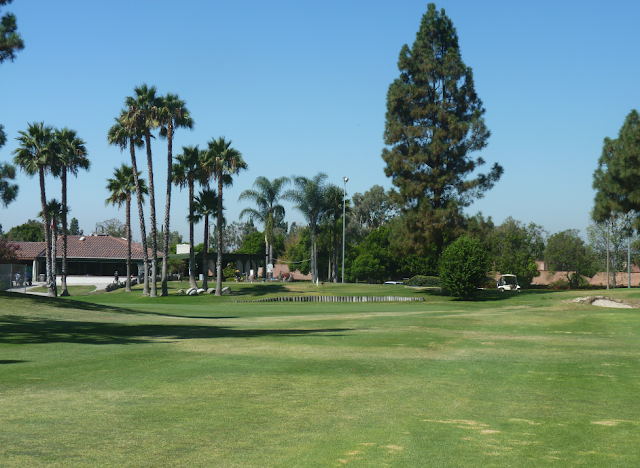 Rancho Duarte is a 9 hole executive golf course located in Duarte – just off the 210 freeway. There is a parking lot with ample parking. In addition to the course, there is a small pro shop a nice bar/ cafe area with shade and couches and a driving range. 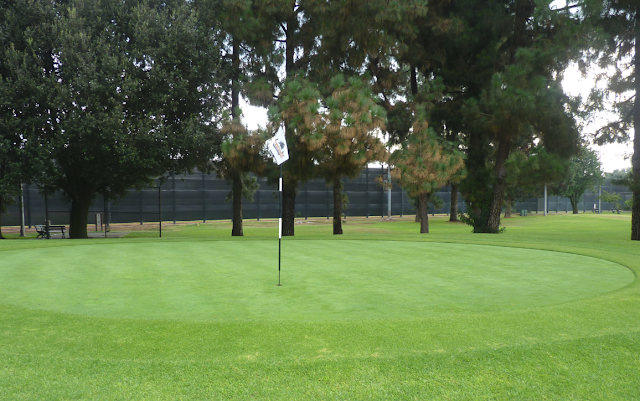 I did not see a putting green, but I did not use the practice facilities. We played at a peak time – Saturday morning. 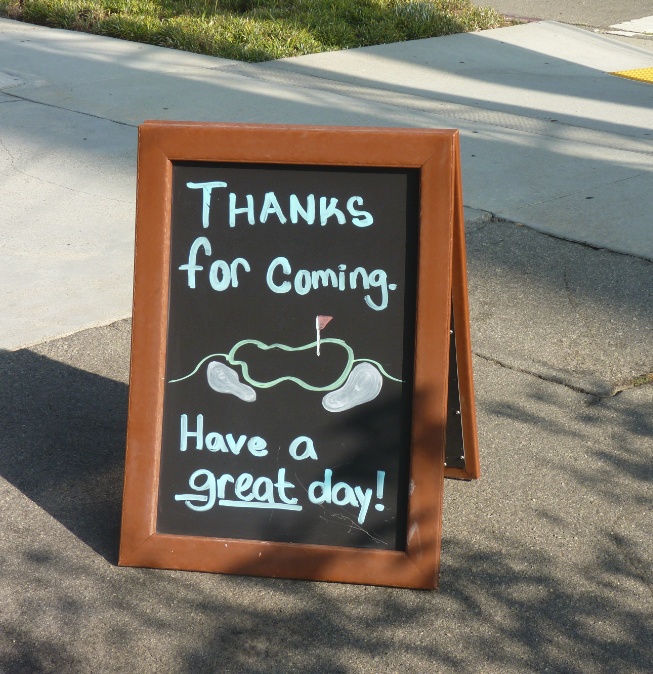 It was not crazy busy, but there were a fair number of people out on the course. That being said, the pace was good. 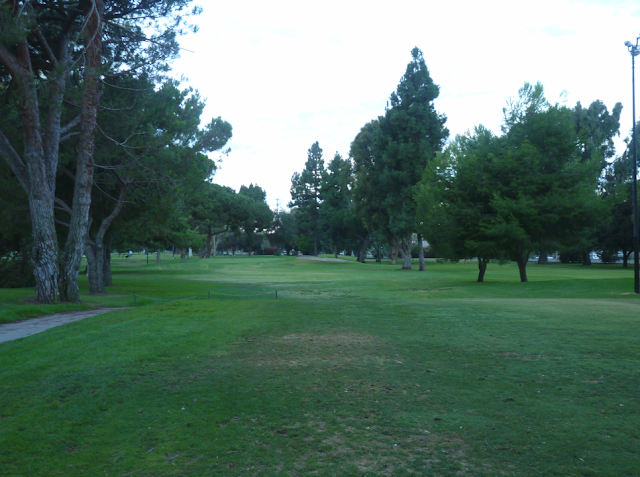 Everyone placed at a good speed and we completed our 9 holes (4 ball) in exactly 2 hours. 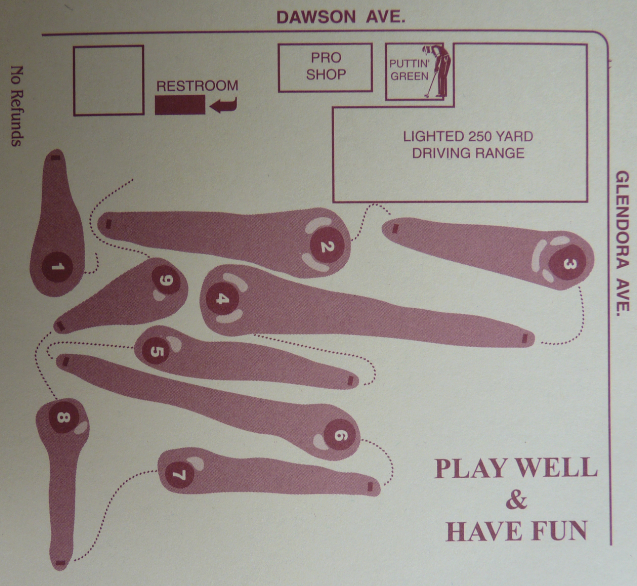 The course is well designed. 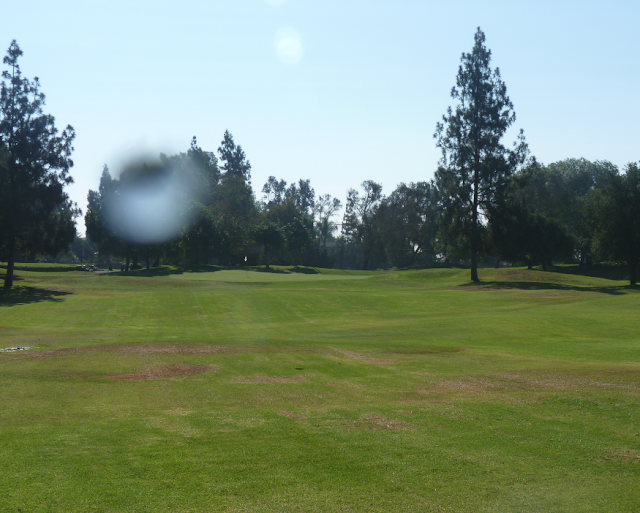 It is surrounded by houses and as we were finishing up, we heard a group a few holes behind smash a window. There are a good mixture of holes which allows you to use a lot of clubs in your bag. Not a driver or a 3 wood much though – as the longest hole is 329 yards, and the second longest 244 yards. You start with a short 68 yard hole and then the holes build up in distance. 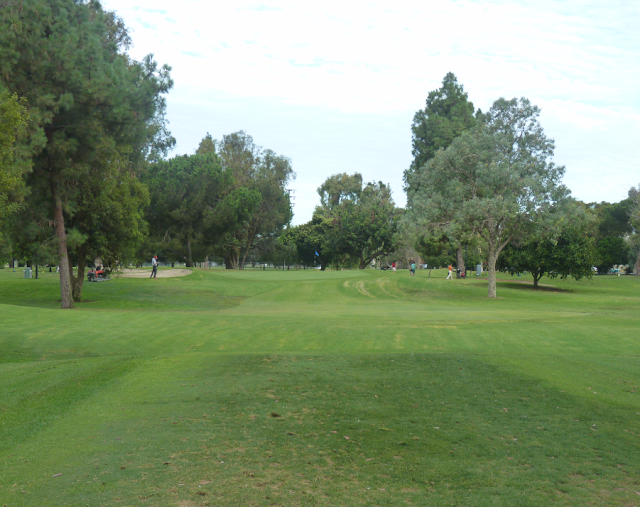 There are four short par 4’s on the course. The longest par 3 hole is 143 yards. 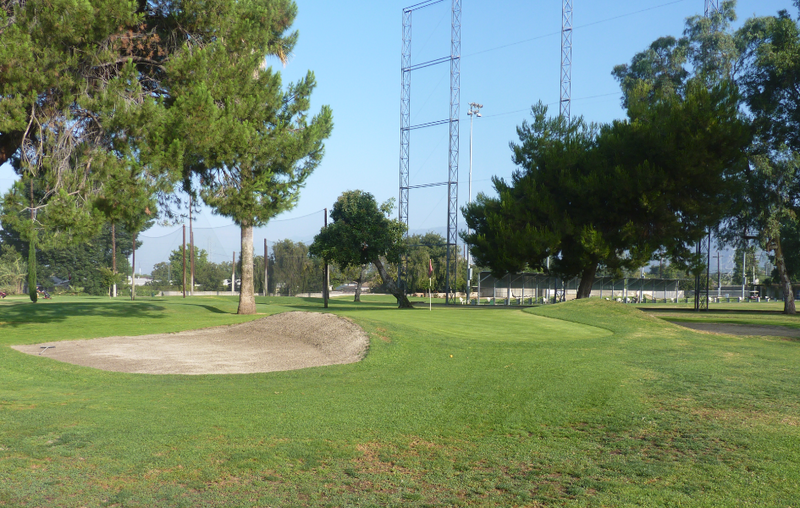 Which makes this course a good one of beginners or people looking to take a step up from the short “pitch-n-putt” courses. Or looking to bridge their game from short courses to full length courses. 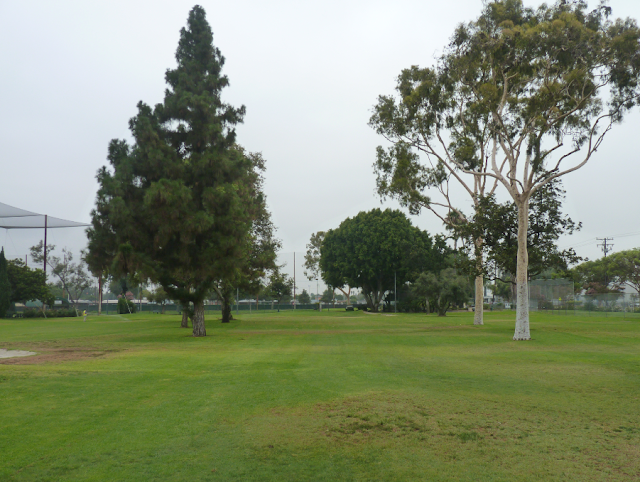 There were no real hazards on the course other than the trees. There were a lot of trees which came into play. No water and a couple of token sand traps. These traps were not really in play though and were not well kept. The course flowed well but is somewhat open. 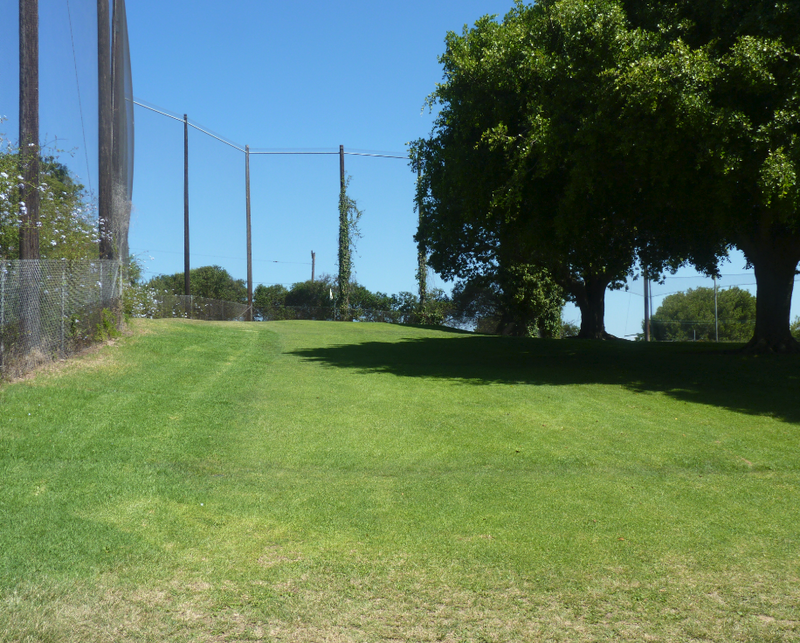 Some of the benches by the tee boxes were in dangerous locations with no fence to protect you – especially hole 7. 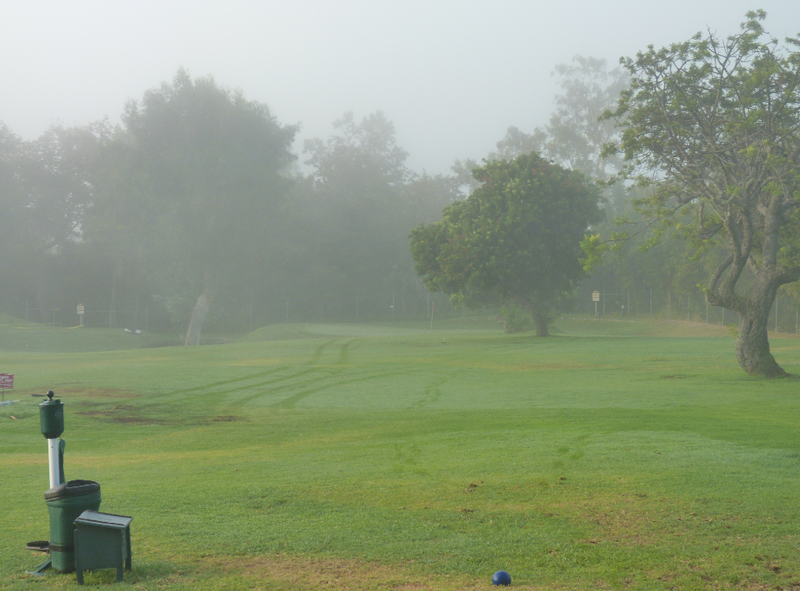 Several times while waiting errant tee shots from hole 8 came whizzing by. The course was in decent condition; above average. 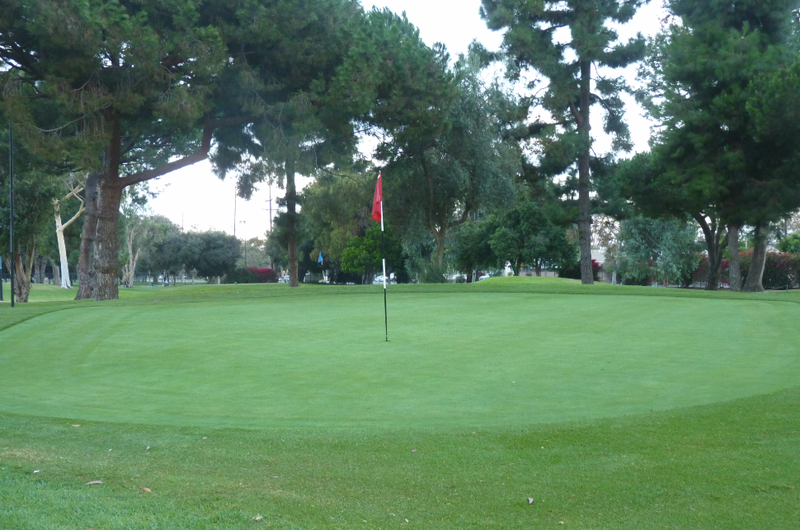 The greens were large and in nice shape. 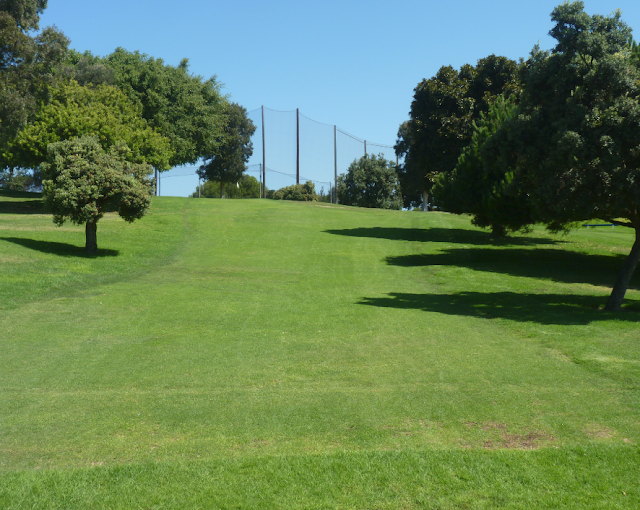 They ran fast and were sloped which made putting challenging. 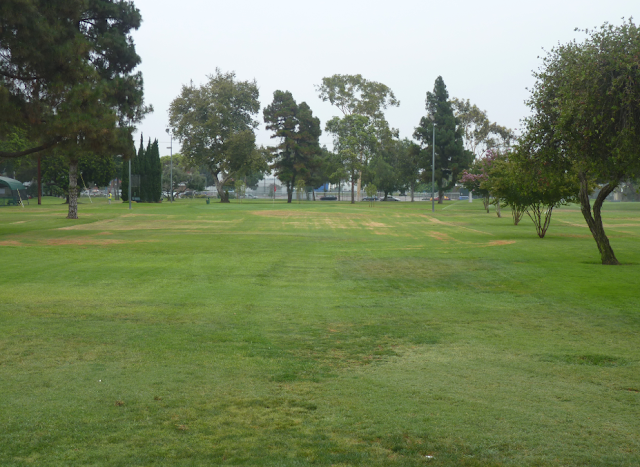 The grass was generally well watered and green colored with the odd dry patch. 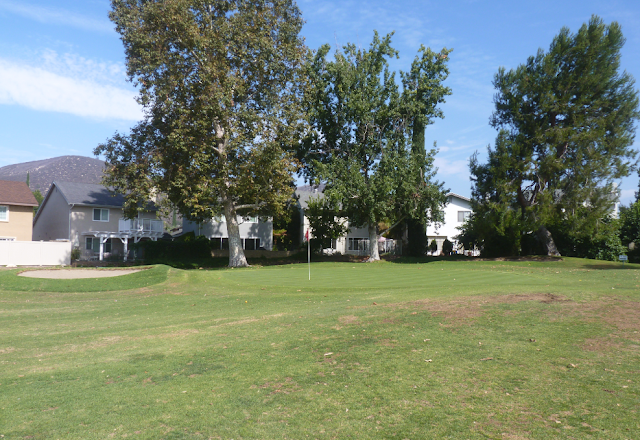 Lindero Country Club is located in Agoura Hills which is on the border of Los Angeles and Ventura County. 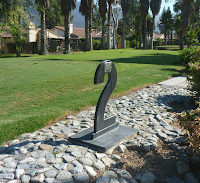 It is located just off Thousand Oaks Blvd. 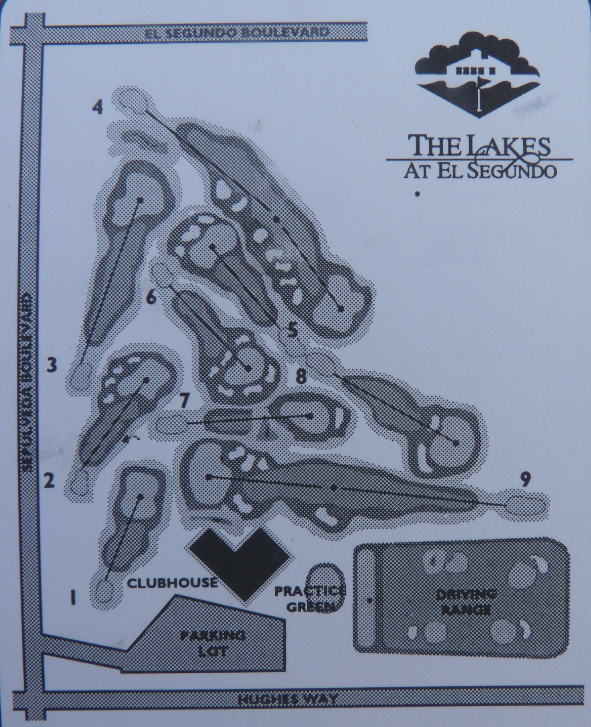 The parking lot is on Lake Lindero Drive. 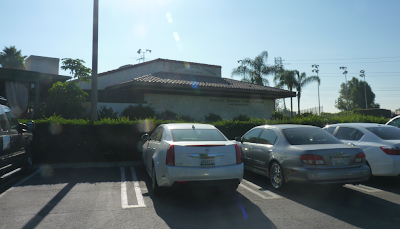 When you arrive there is an ample sized parking lot. 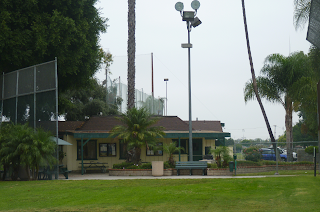 In addition to the golf, there are tennis courts a snack bar and an event space for weddings etc. There is the 9 hole executive golf course and two putting greens and a driving range located here. Although it is a country club, public people can pay and play the golf. Standard golfing attire is required – collared shirt etc. The course is executive as there are two short par 4’s, making the course a par 29. The course is designed very well. 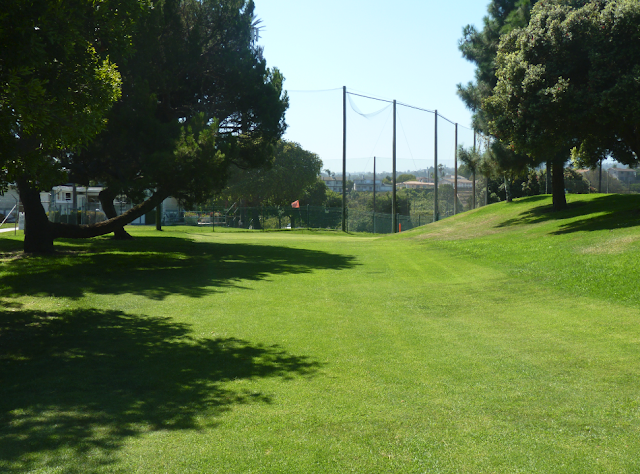 The shortest hole is 123 yards and the longest is 285 yards. 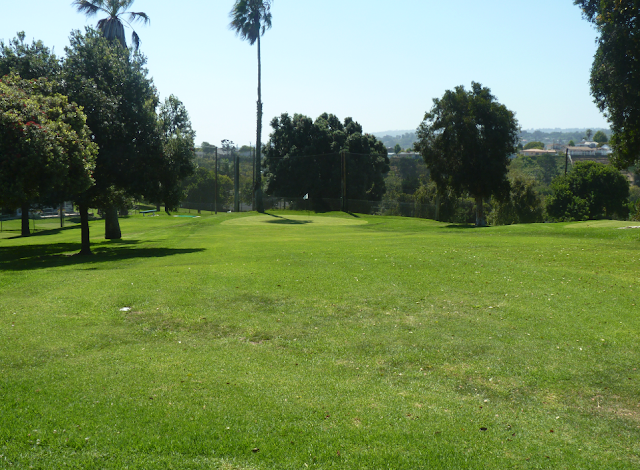 The course is very challenging to play. In fact one of the hardest I have played. 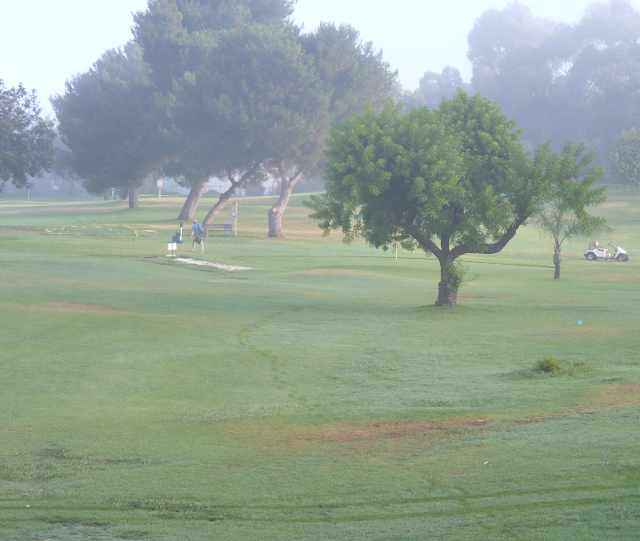 Each hole has danger whether it be water or sand. 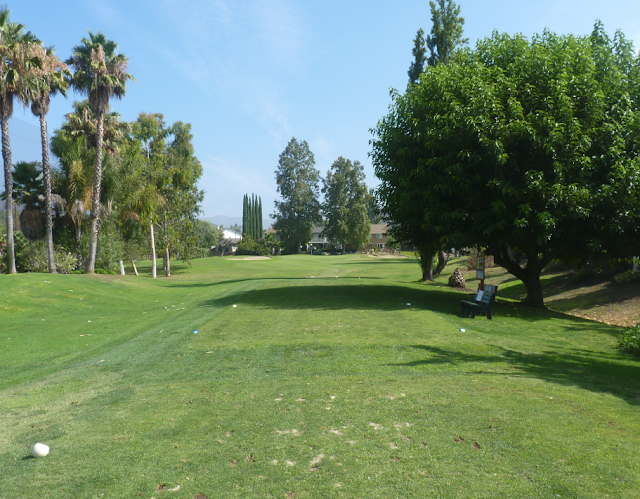 As it is so challenging I would recommend that only intermediate/ advanced players play here. 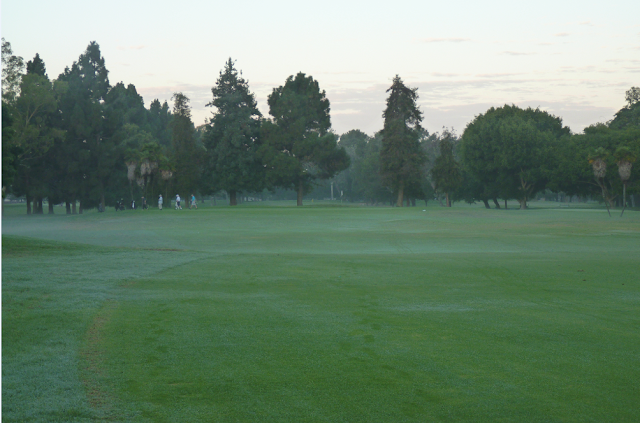 If you are just starting out it may be difficult for you to hit greens and keep the ball in play. 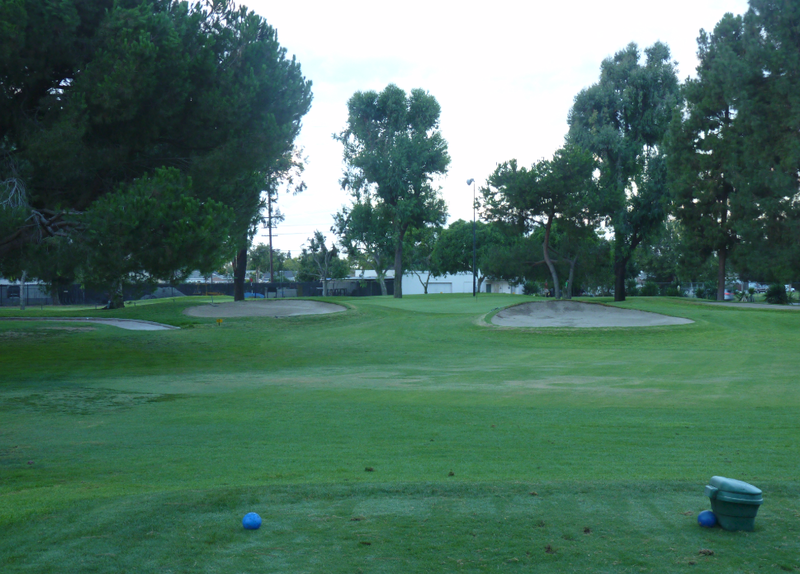 The pin positions were also in really tough locations to make shot making even more challenging. 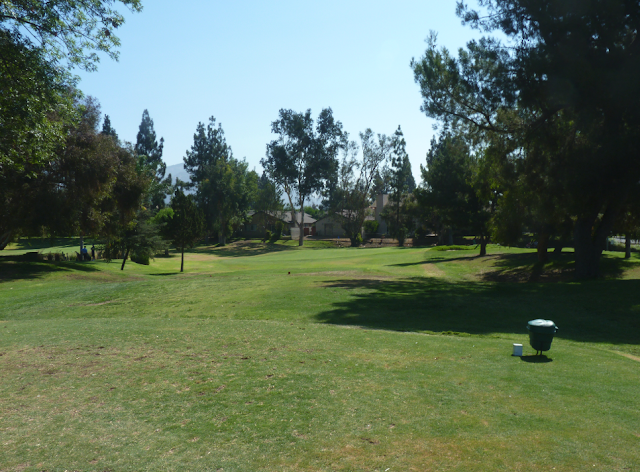 The course winds through an HOA community and many of the holes are surrounded by houses. 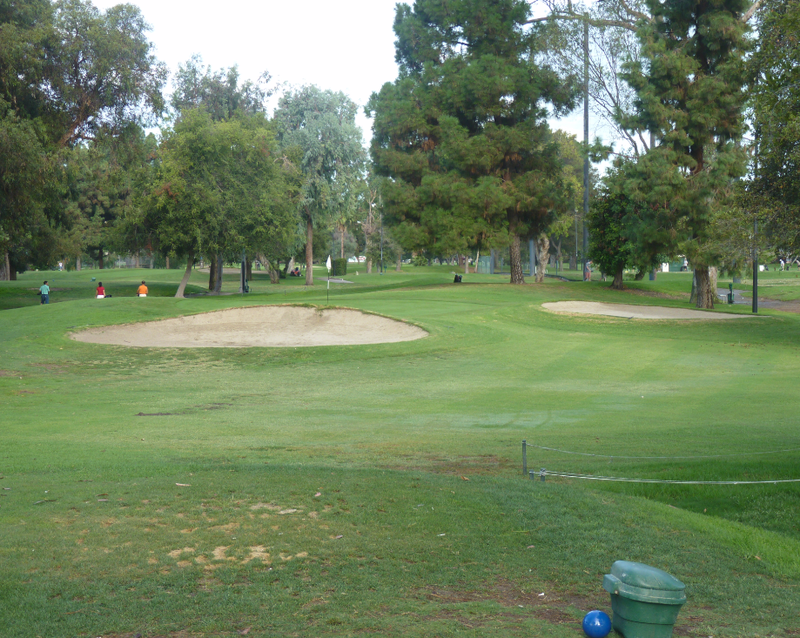 On the second hole dogs would park from their respective yards as I approached the green. 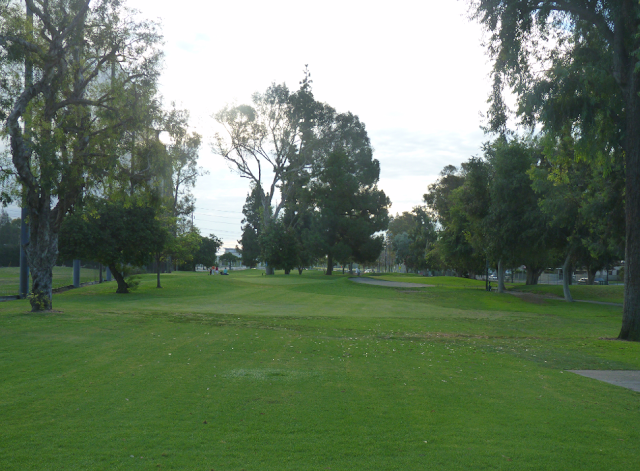 You play 6 holes and then cross a main street to play the remaining 3 holes. Some of the par 3 holes were long and all of the holes required accuracy to accomplish a good score. 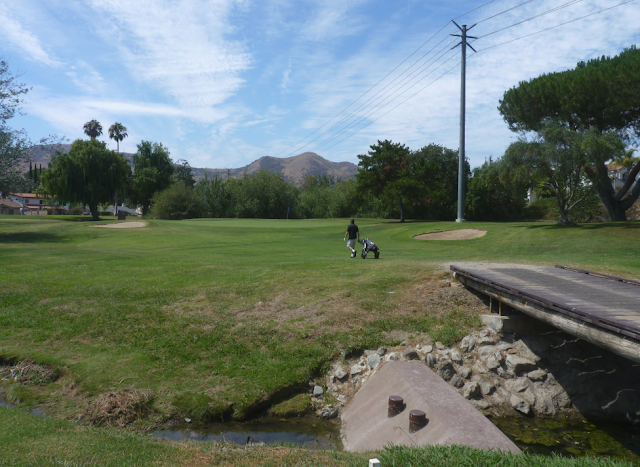 I enjoyed hole 3 in particular – a dog-leg left. 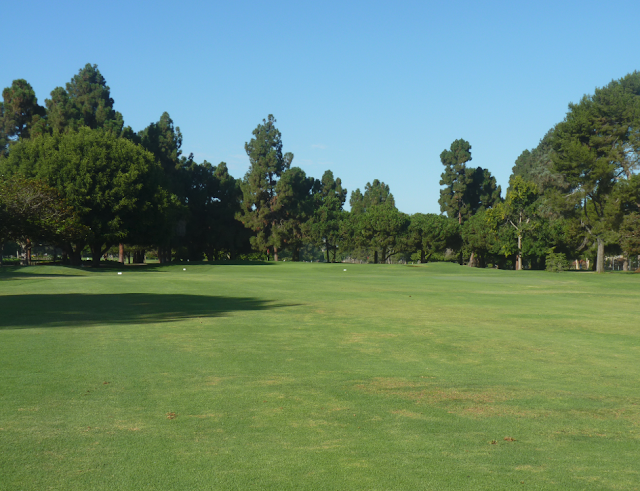 You have to tee off over some reeds and lay up on a small fairway. 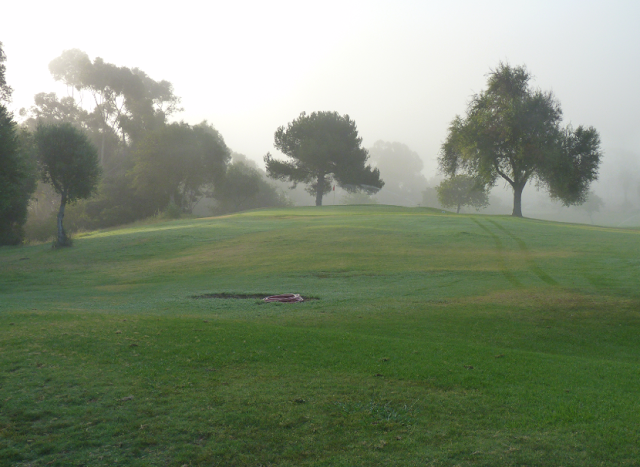 You then play your second short into the green over a creek. There is a creek that runs through the first 6 holes and is in play for a lot of shots. There are two tee box locations for each hole. Which means if you do a replay and play 18, the holes will play differently on the back 9. 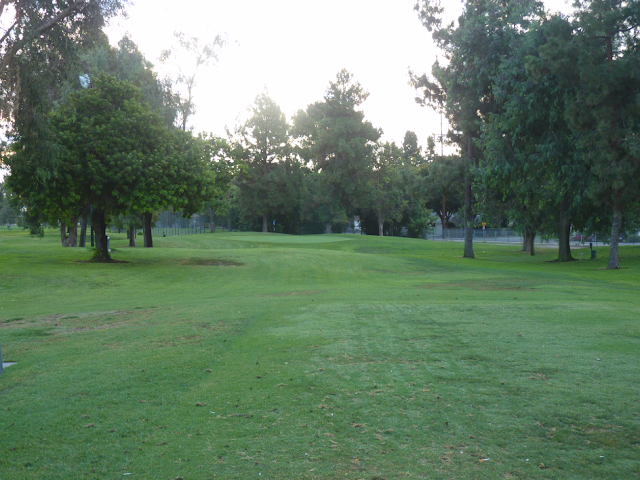 The course was in good shape. 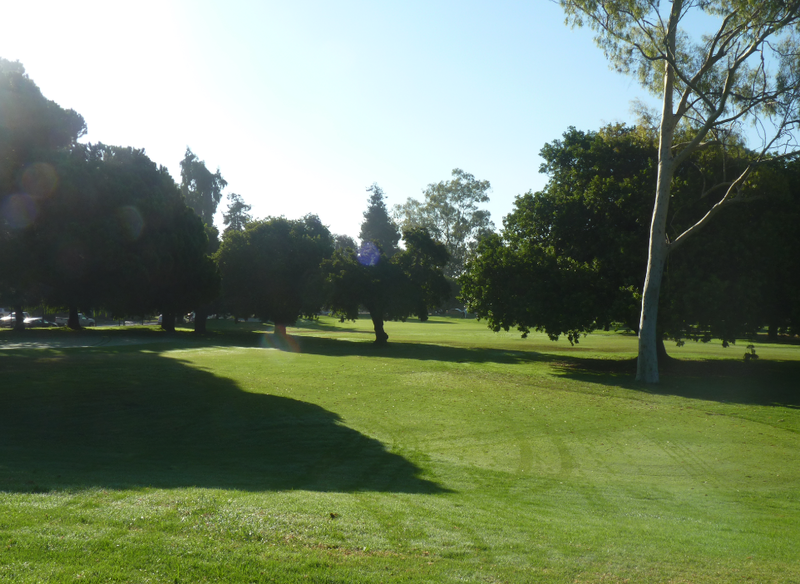 I understand that they have worked a lot recently on improving the course and the last 3 holes have been redesigned. I read poor reviews online before I played, but when I arrived I was pleasantly surprised. It was in a nice condition. 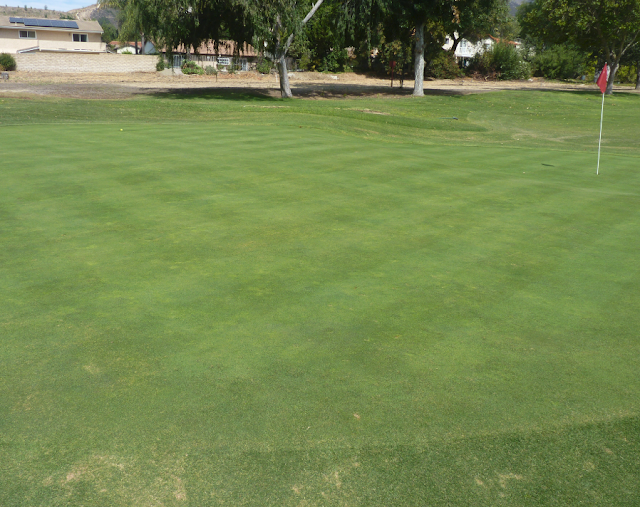 The greens ran well and were of a good size. 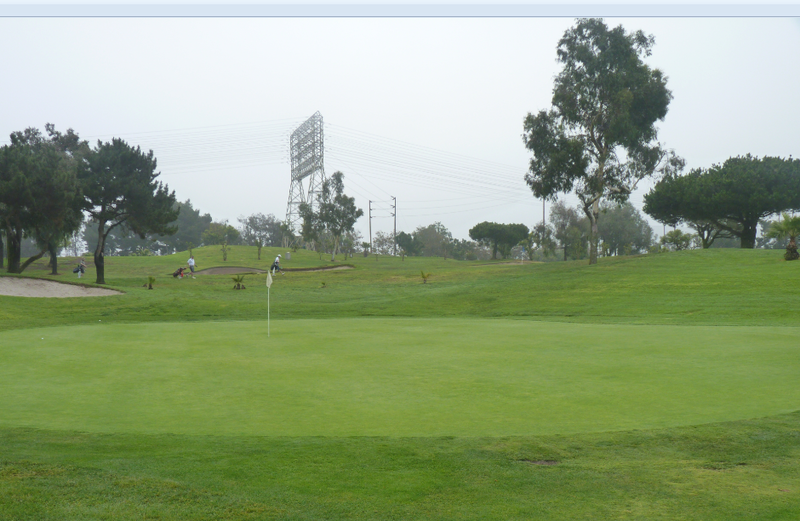 The most noticeable green was on hole 5. It had two levels and had a steep slope running down the center of it. 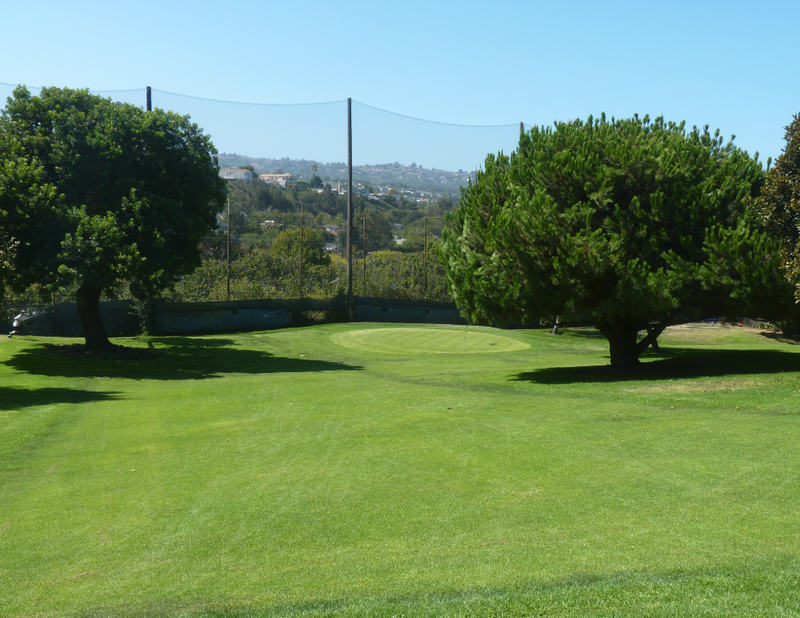 You hit off the grass – standard tee boxes. There were no mats – yay! 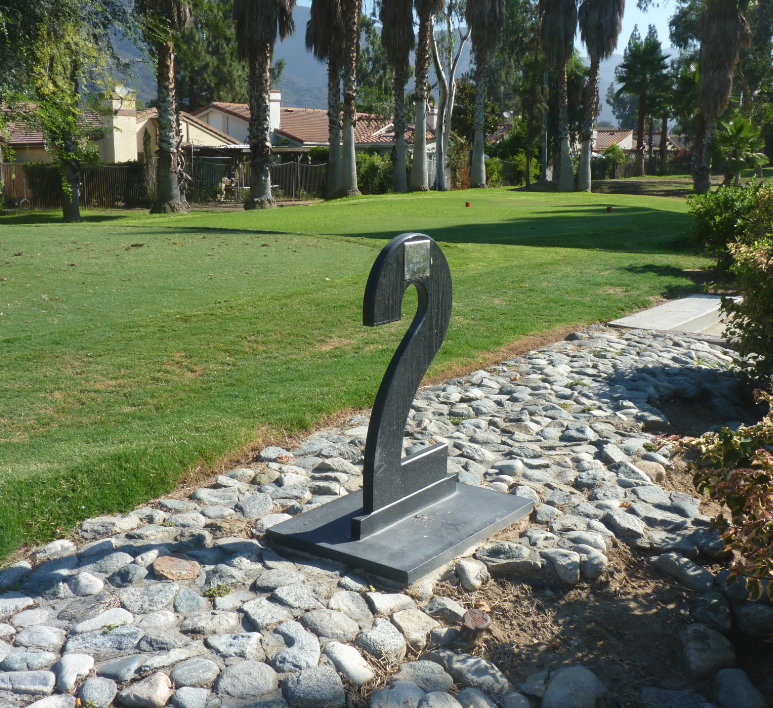 There were ball washers and yardage signs at each tee box. But not benches or places where you can sit while you are waiting to tee off. I played on a Saturday morning (peak time) and the pace was decent. 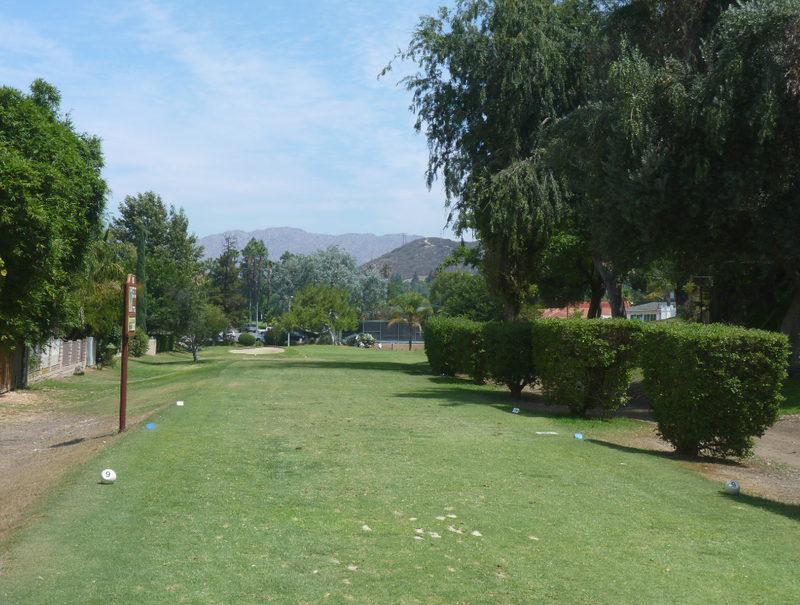 There were a few short hold-ups on a couple of the tee boxes, but we still managed to get around and play the 9 holes in about 1 hour 45 minutes. I understand during the week this course is very quiet. Note – I booked a tee time directly on the country club’s website and got a great deal. They have last minute deals. I went online on a Saturday morning at 7am and booked a 10.30 tee time for that same morning and it just cost $5! 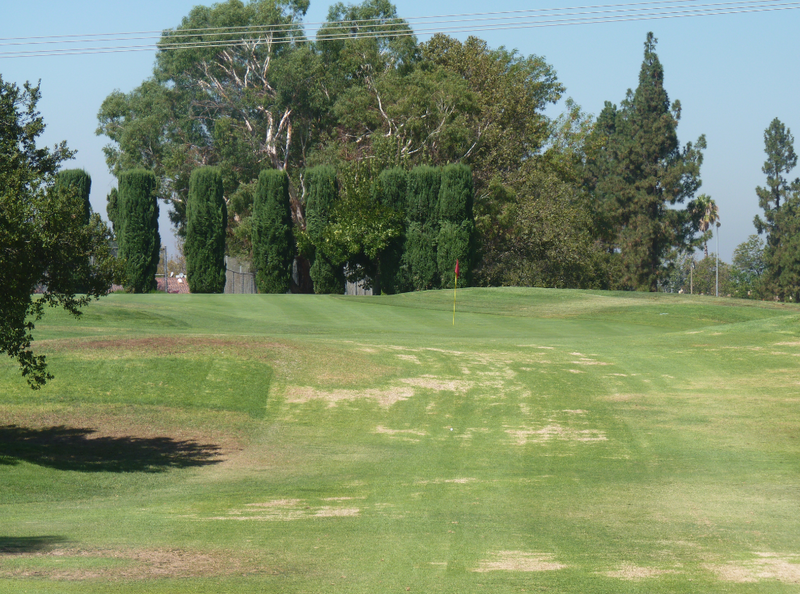 9 holes for $5 you can’t go wrong! Just remember to bring your confirmation number with you to provide to the starter. She told me she had no way to look it up on her end. 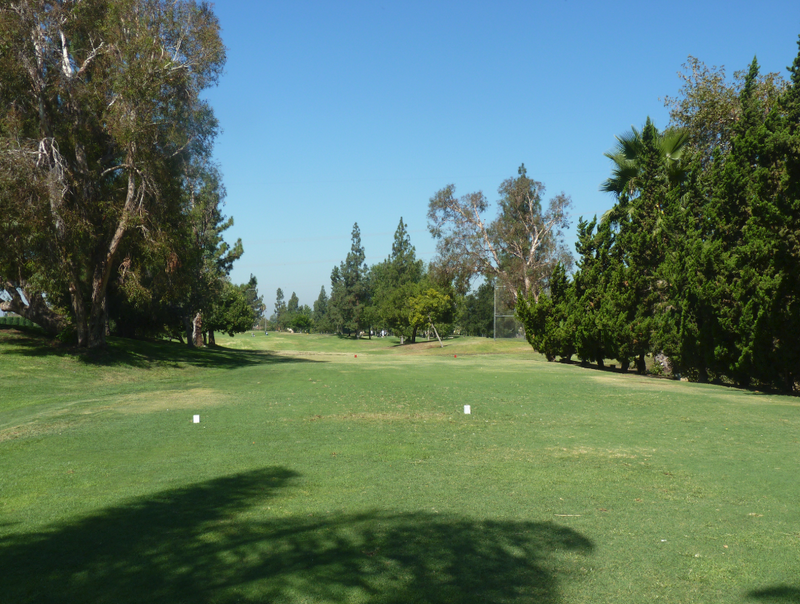 Bell Gardens is a 9 hole par 3 golf course located in the City of Bell (5 miles south of downtown Los Angeles). 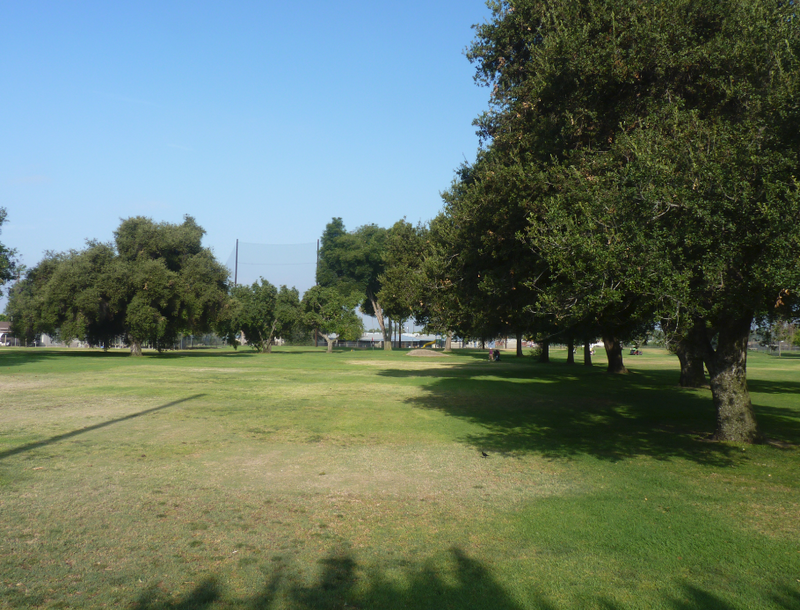 It is at the John Anson Ford Park. It is tricky to find. 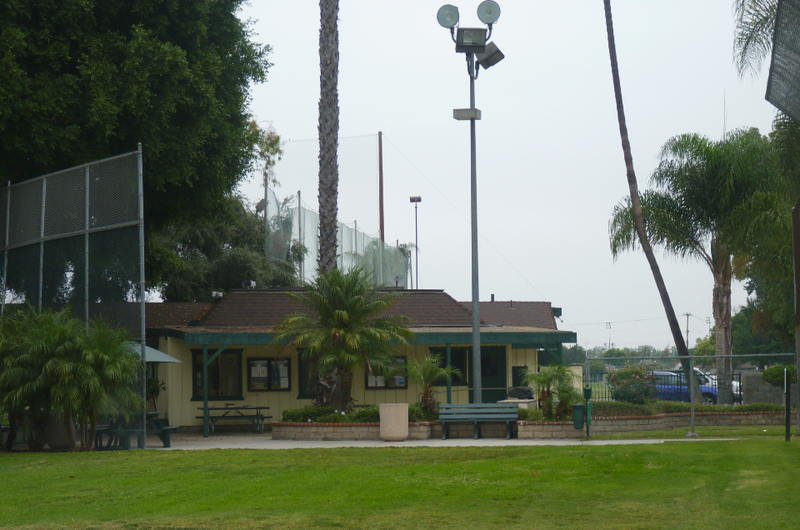 It is at the north end of the park by the Bell Gardens Sports Complex. The best way to get here is to exit the 710 at Florence. Take Florence south for a couple of miles. Make a right on Garfield and then a left on Park Lane. 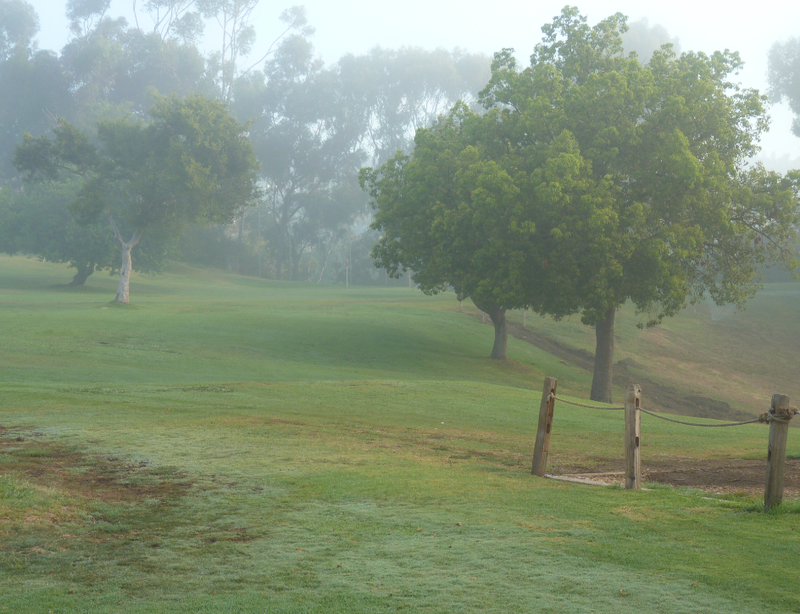 The entrance to the course will be on the right. You drive past a football field and there is a large parking lot. 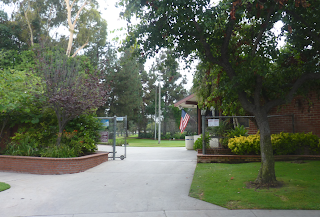 The entrance to the golf course is at the far end of the parking lot. I was really pleasantly surprised when I arrived to Bell Gardens. It is nicely landscaped when you walk in. There is a practice putting green and a small snack bar/ sports bar adjoined to the starters office. There were TV’s within the bar area with sports stations playing. The starter was very friendly and chatty. 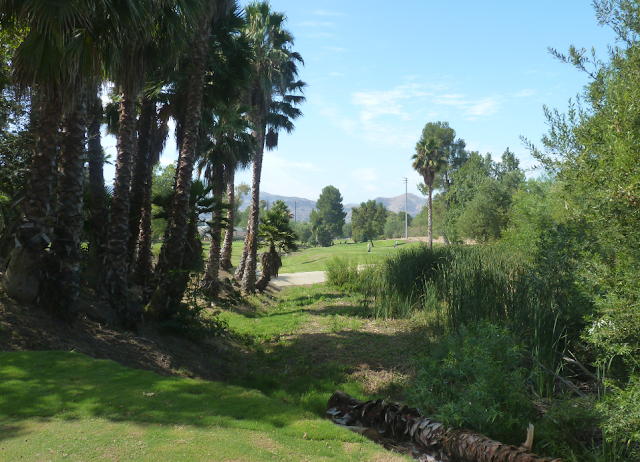 From the starter office you walk down a path lined with plants/ shrubs to the first tee. It is a very nice way to start the round. 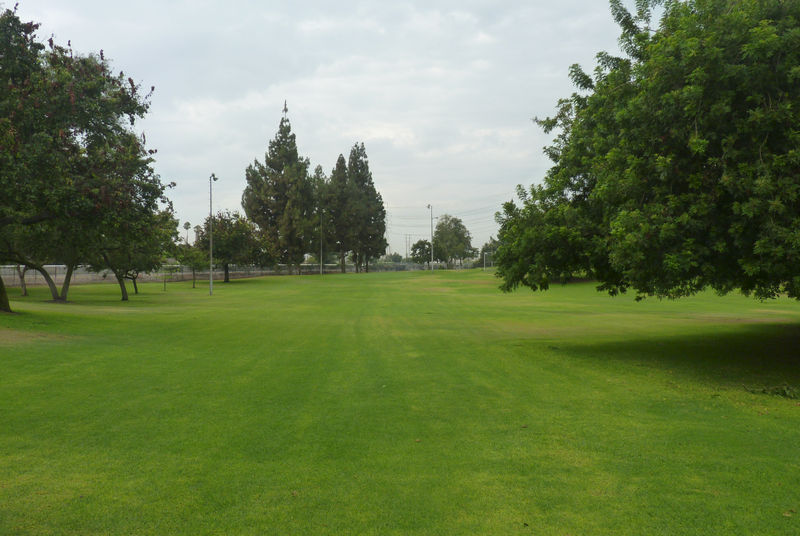 The first thing which hit me when I stepped onto the first green was the lush green grass. 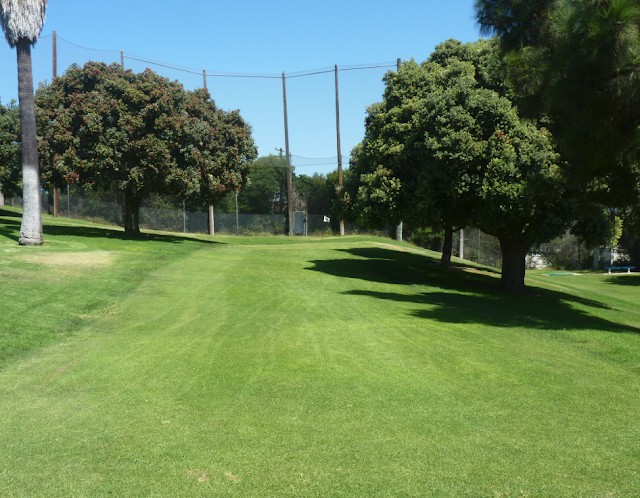 A rarity to see on a Los Angeles par 3 golf course in summer months. 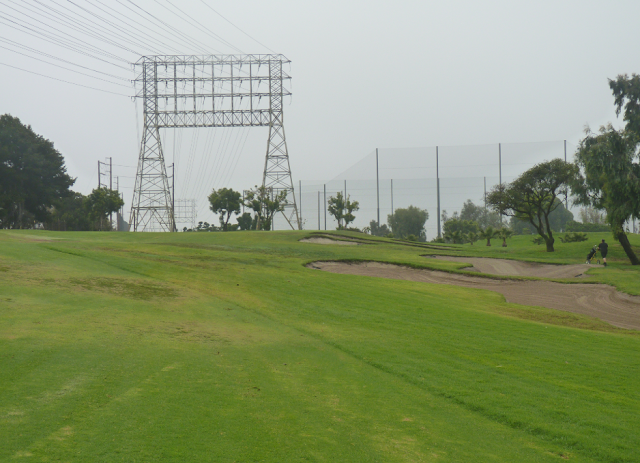 The condition shocked me; a few weeks earlier I played at South Gate and I was expecting to see the same. I was mistaken – this course is far superior. 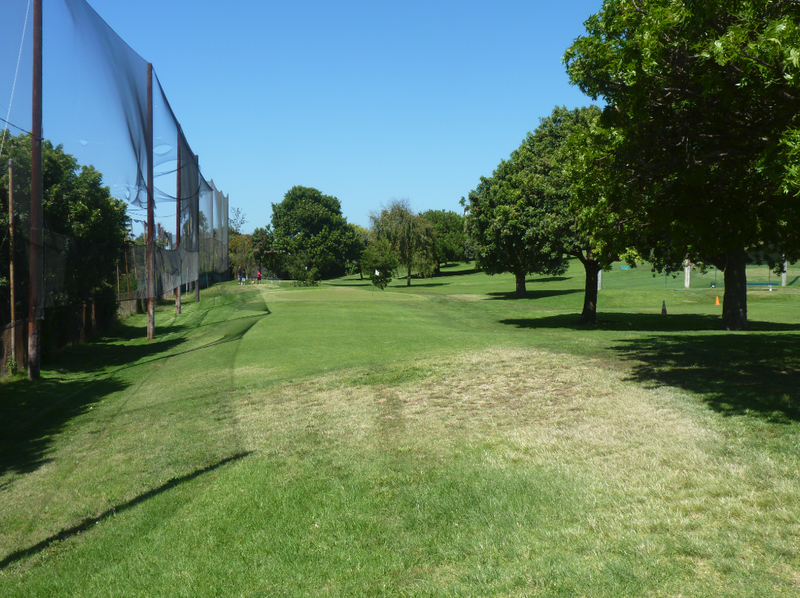 You hit off mats, tees are provided and perfect size for wedges/ short irons – not high tees. 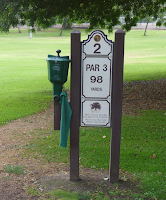 Each tee box had a ball washer and a couple of benches. 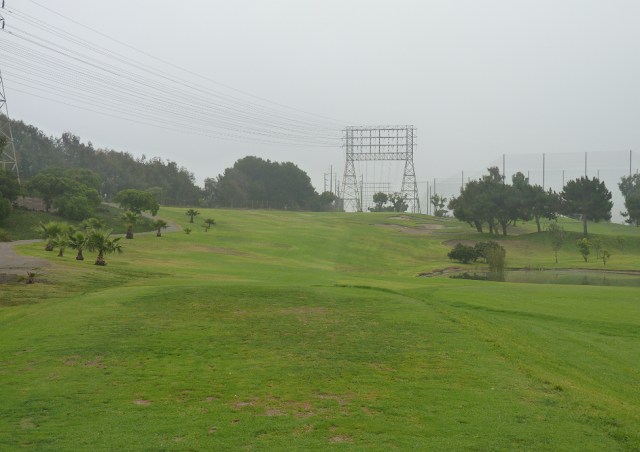 I really enjoyed playing this course. 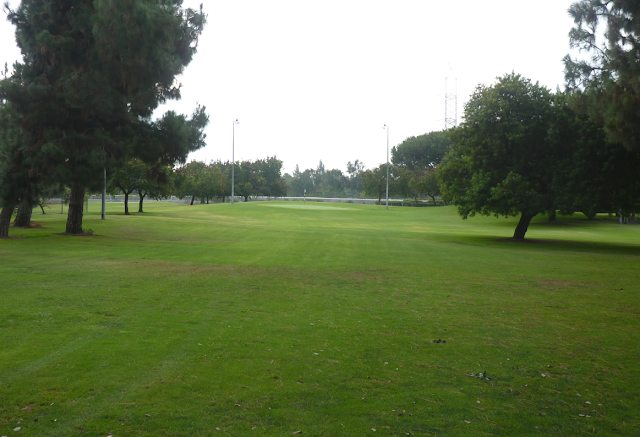 As I previously mentioned the grass was lush and green. 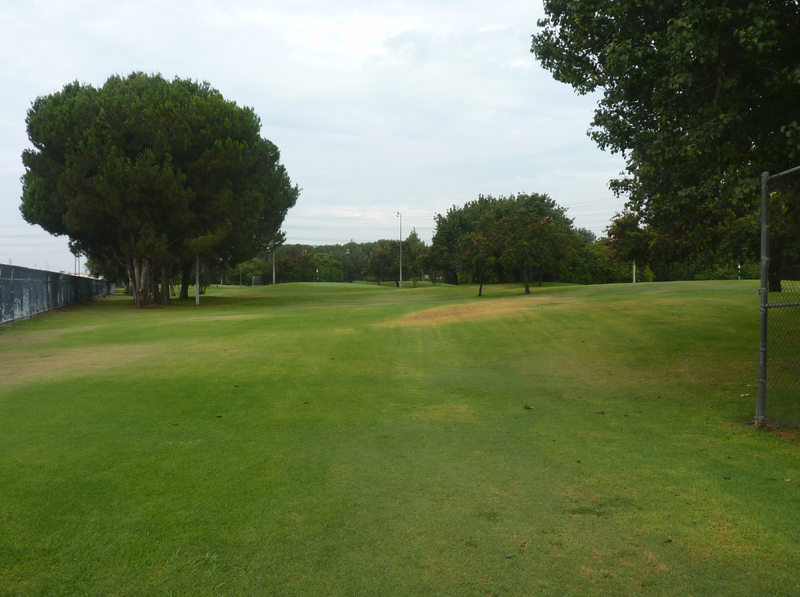 There were not any patchy areas and the condition of the course was very good. 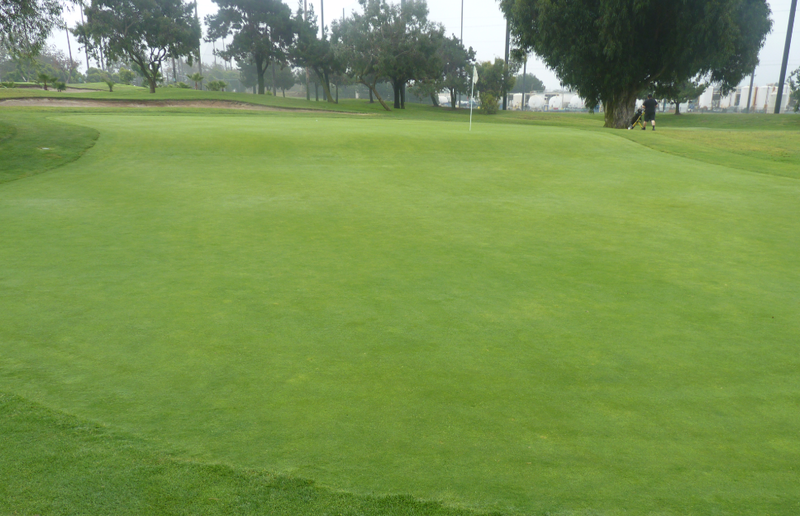 The greens were nice also. They were on the small side but sloped. 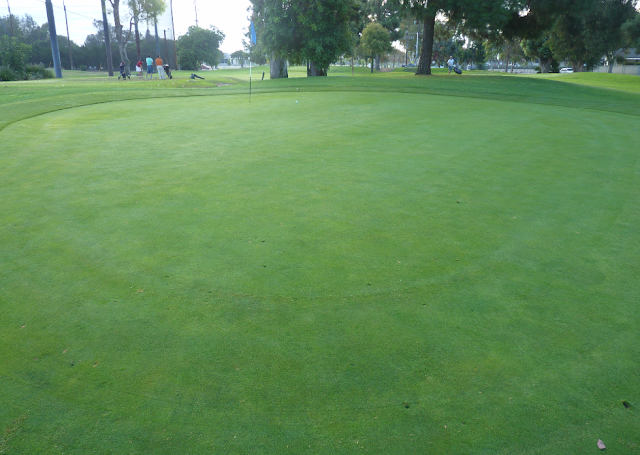 There were not many flat putts and putting was a challenge. 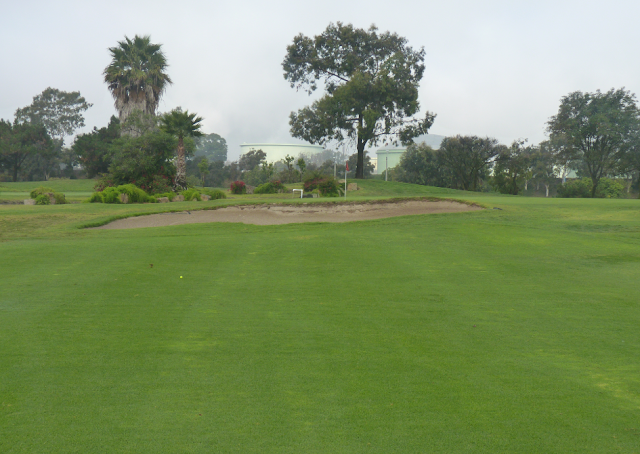 Also hitting the greens was a challenge because they were so small. 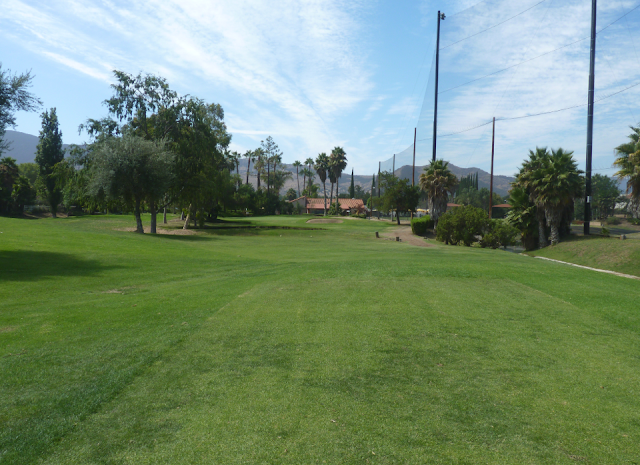 The longest hole was 124 yards, so you could probably play the whole course with a putter and a pitching wedge. 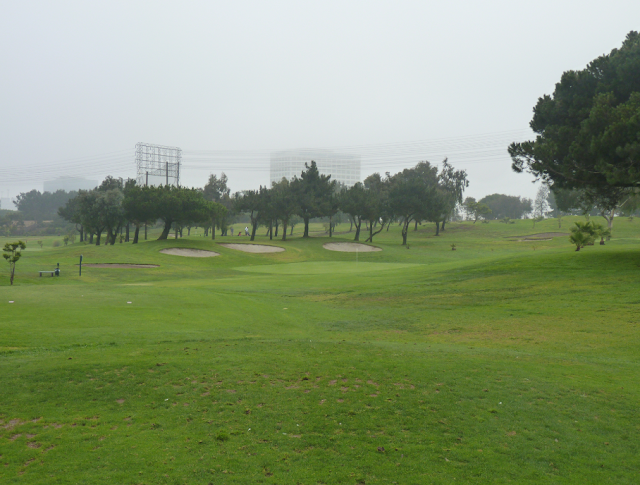 Although the course condition was very good, I noticed it did deteriorate slightly as I went through the round. 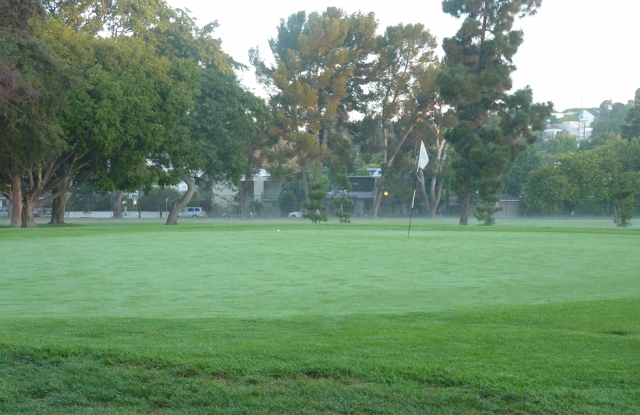 I am unsure why, but the greens on the last few holes looked a little patchy. 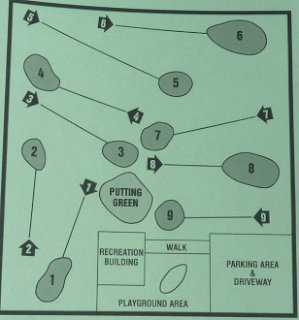 The course design was adequate, not great. 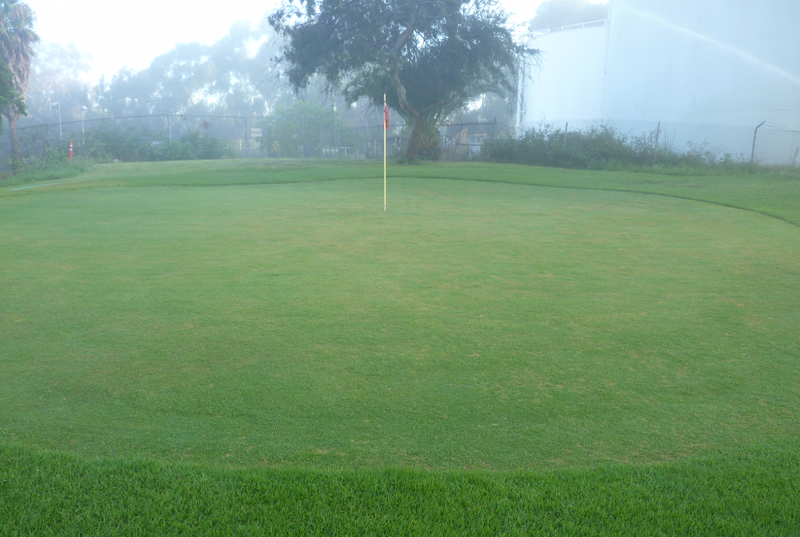 The greens were elevated and sloped. 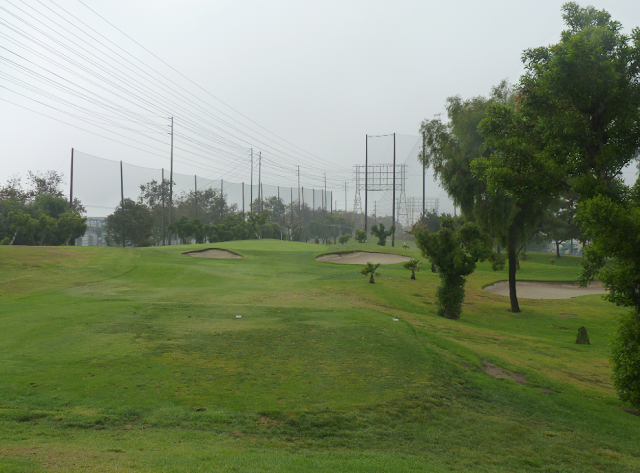 But each hole was pretty much straight and around the same distance – 6 of the 9 holes being between 98 and 111 yards. There were no bunkers or water hazards on the course, just trees. I thought the trees were placed in good areas and there was a good number, not too many. 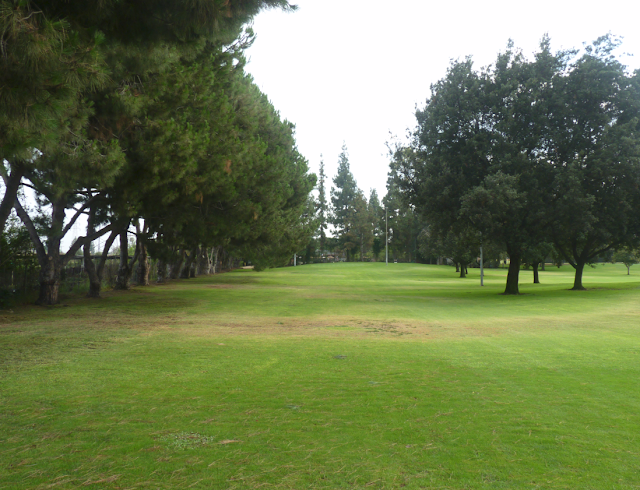 The course had a nice flow to it and it was easy to find my way around to each hole. The course reminded me a lot of Maggie Hathaway in it’s look and design, just a little shorter. I wonder if it was designed by the same person?? Note that this course asks that proper golf attire is worn. No jeans or T-shirts. I am unsure if they actively enforce this or not. But everyone else I saw on the course was dressed appropriately. 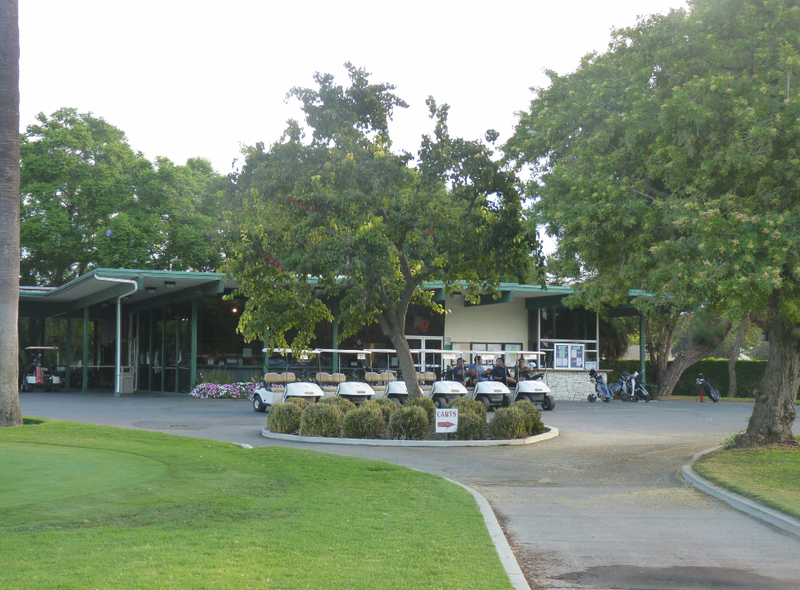 Glen Oaks Golf & Learning Center is located in Glendora. 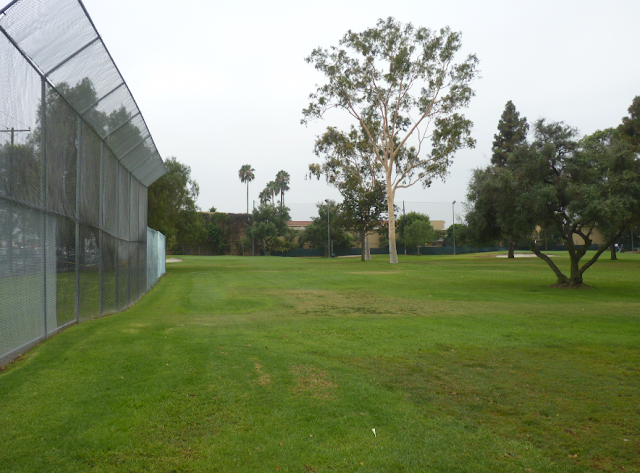 It is just off the 210 freeway, exit Grand Ave. The course is just a couple of minutes drive from the freeway. 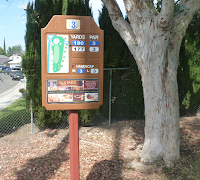 The parking lot is located across the street from the golf course. You have to park and then cross the street to the starters office. 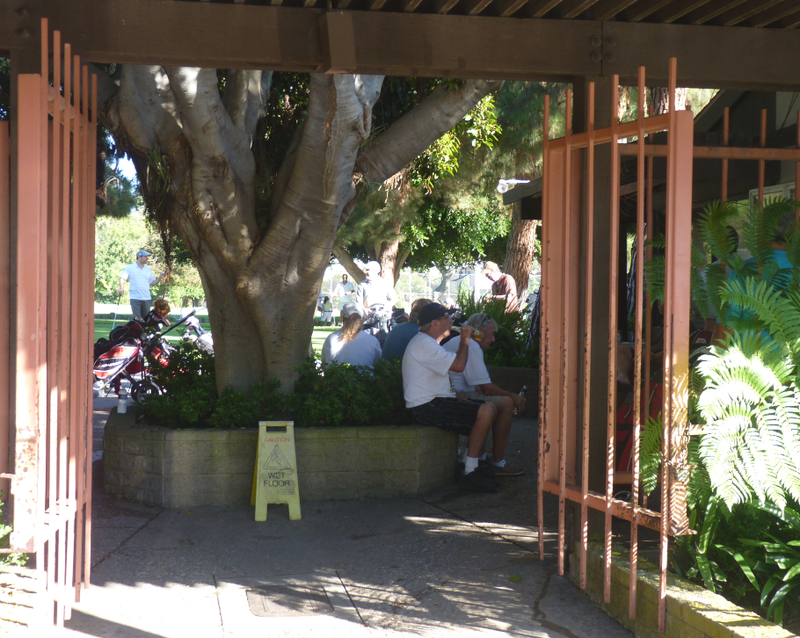 The staff were friendly and located in the starter office was a small cafe/ snack bar. 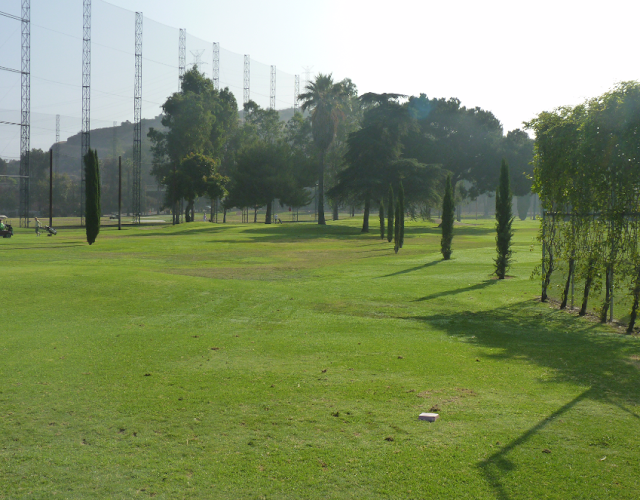 In addition to the golf course, there is a really nice driving range with practice putting greens and chipping areas. The course itself is a 9 hole par 3 golf course. There is good variation in the hole lengths, with the longest being 151 yards. 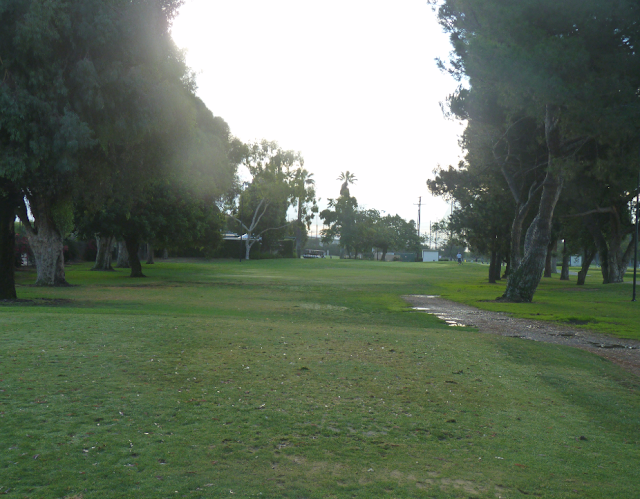 I found the course was a little difficult to navigate and didn’t flow all that well. 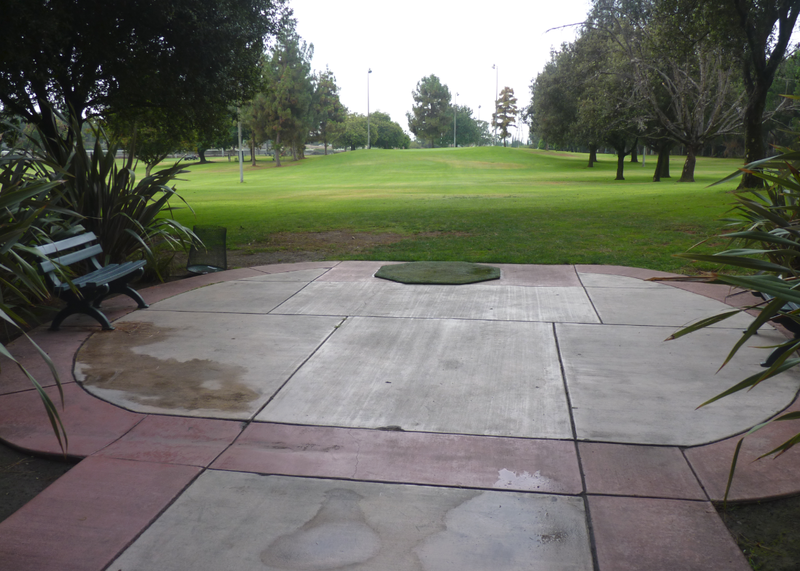 Sometimes there was a 30-40 yard walk to the next tee box. 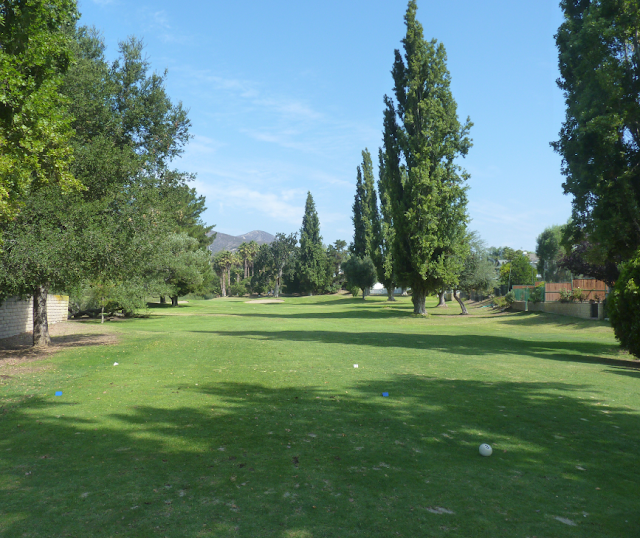 With an open style course it was tricky to figure out the layout when playing here for the first time. The tee’s were marked. However they just had the hole number on. 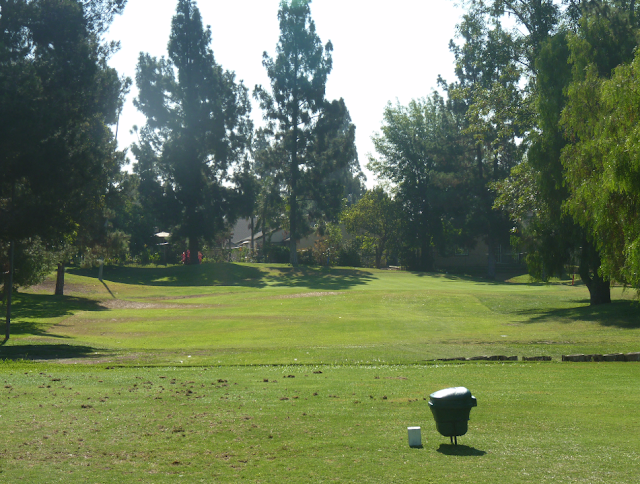 There was no yardage listed at the tee box. 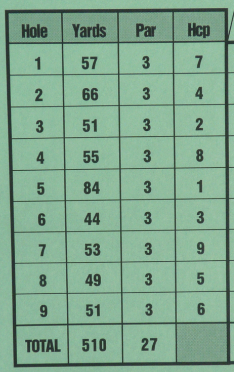 Thus meaning that I had to reference the scorecard for yardage which slowed down play slightly. 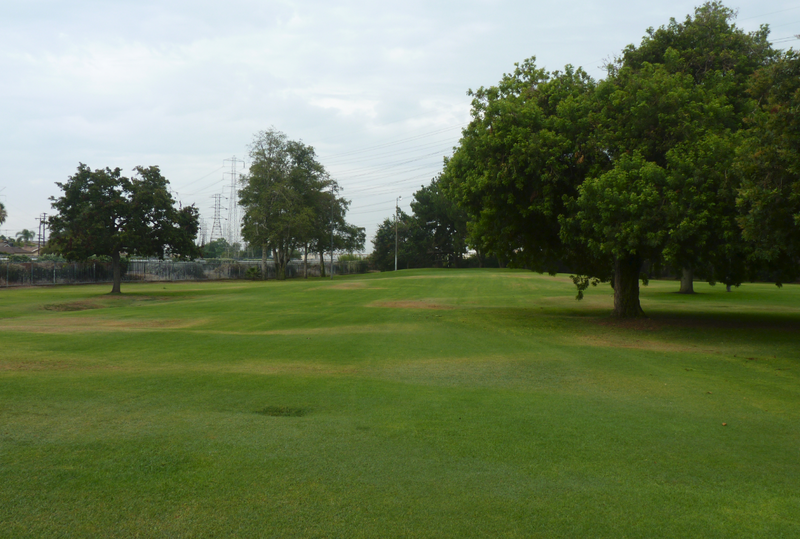 Also the course was designed where almost all of the holes ran in a west-east/ east-west direction. 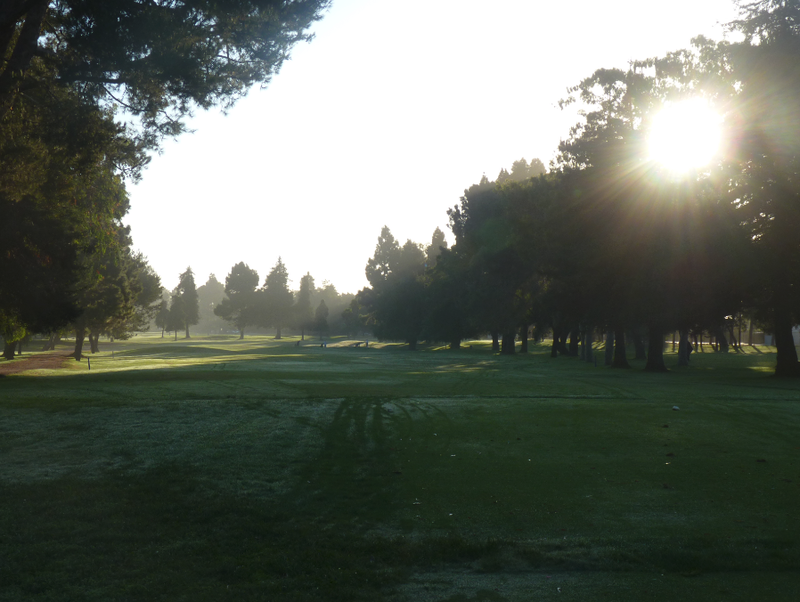 Therefore meaning if you are playing when the sun is rising or setting, you will have the sun directly in your eyes for half of the holes. 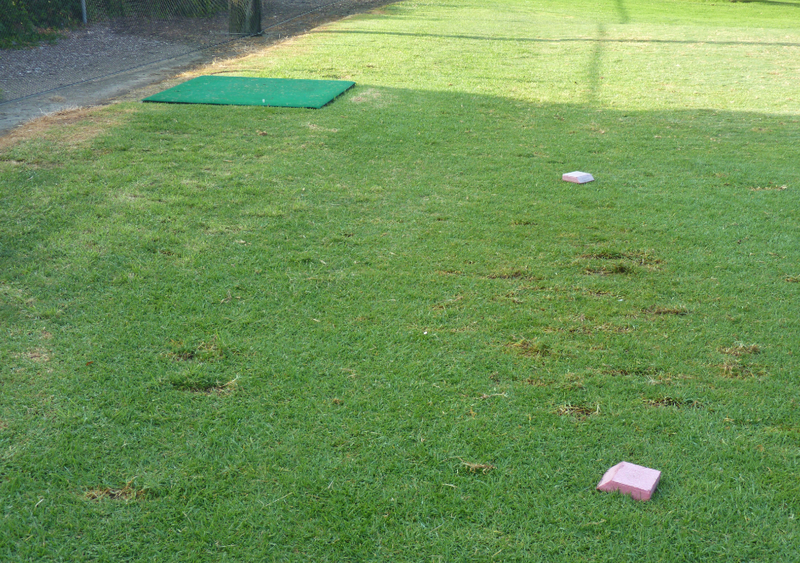 Each tee had a mat, with tees provided and also an area where you can hit off grass. I liked the fact that you have the option. 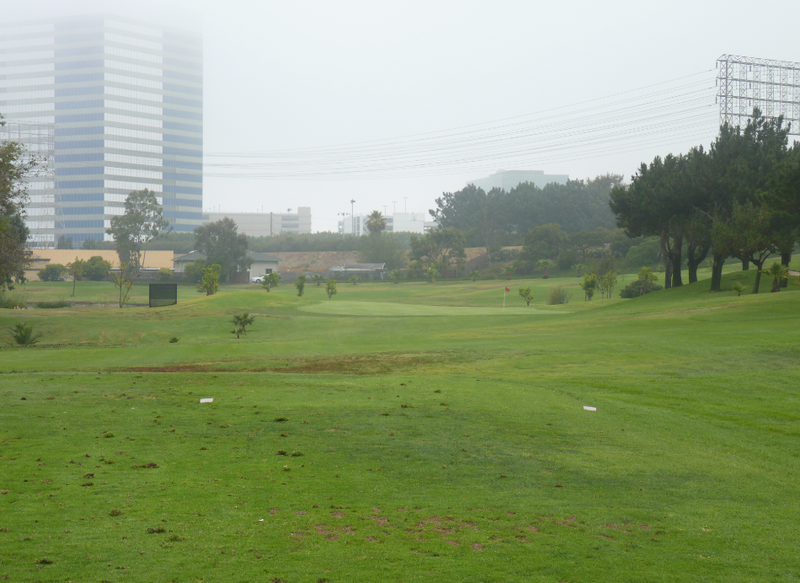 The course was pretty challenging mainly due to the greens. Some of them were a little small for my liking, but they ran super fast. For a par 3 “pitch and putt” course I think they were running way too fast. 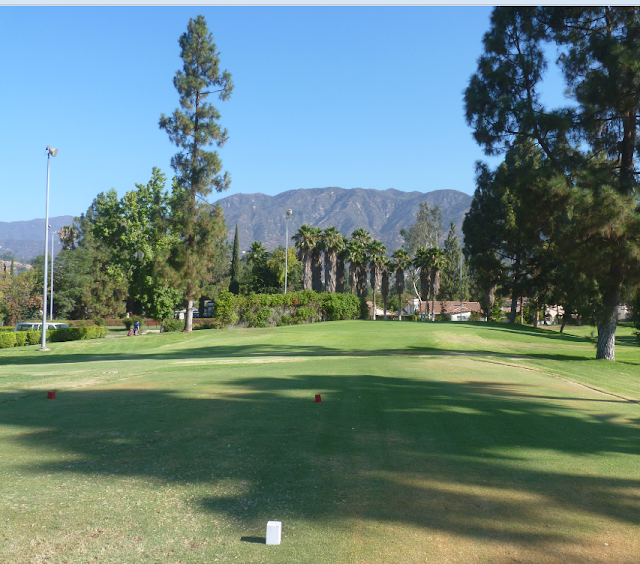 It was like putting at Augusta National (although I have to admit never visited there, let alone played). All holes had green-side bunkers which were in nice shape with good quality sand. The greens had undulations and interesting shapes – the most notably being hole 3. 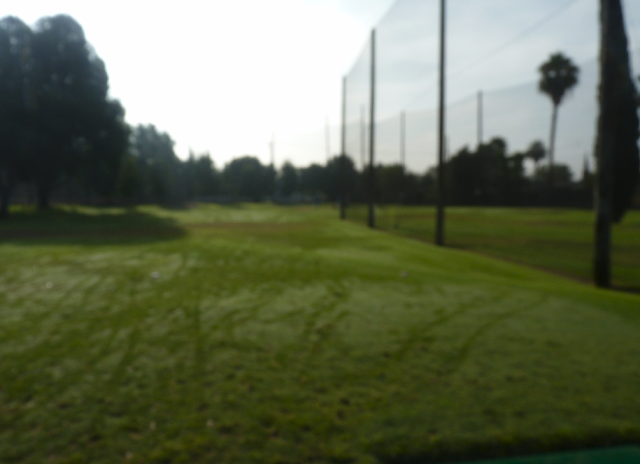 The course condition was very good. The greens were excellent, although small and ran too fast – as I stated earlier. There were no patchy areas on the course and it looked in great shape. 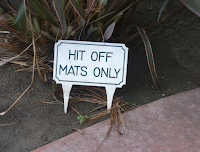 The tee mats were very good and not worn. 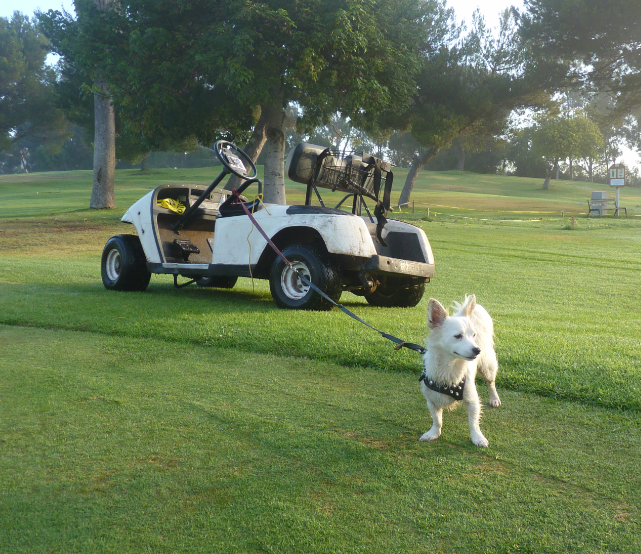 There was however a lack of ball cleaners. I only saw about 2 on the whole course. The pace out there was pretty slow. 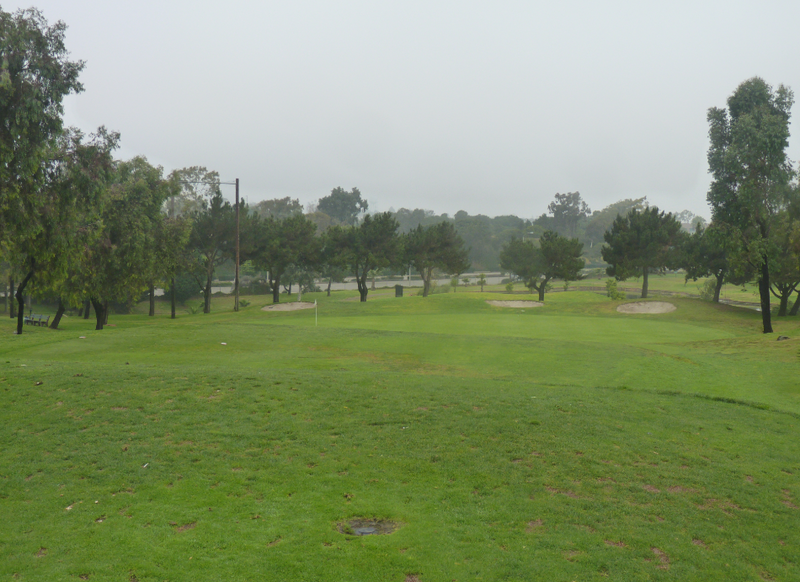 I went on a really off-peak time and the course was busy with a lot of 4-balls out there. 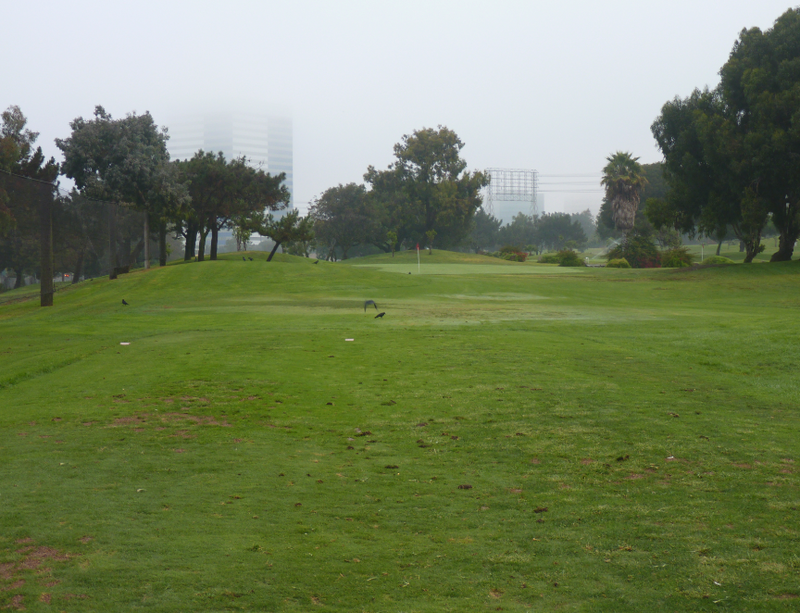 At the time I played, I usually have the course to myself at other locations. I would be reluctant to play here at a peak time. I imagine it would be slow going. I must say though that the other golfers out there were courteous and waived me through if I caught up to them.